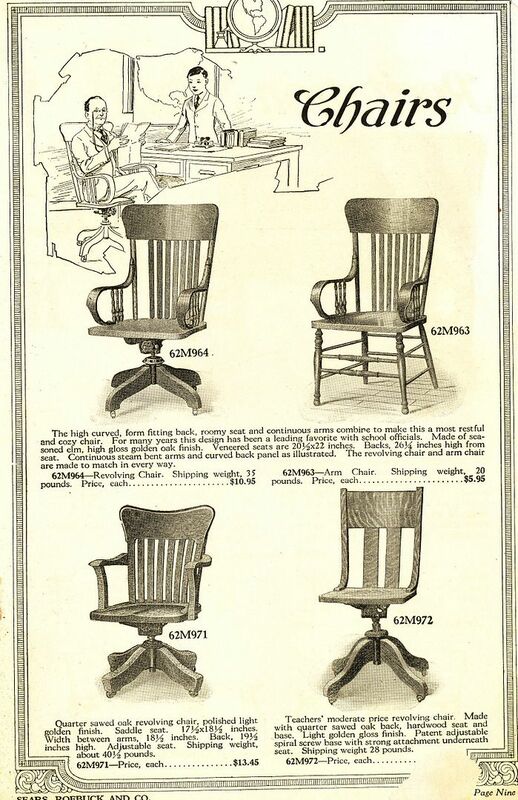 Bit by bit, I’ve been donating my vintage catalogs and ephemera from Sears Roebuck to Old Dominion University. 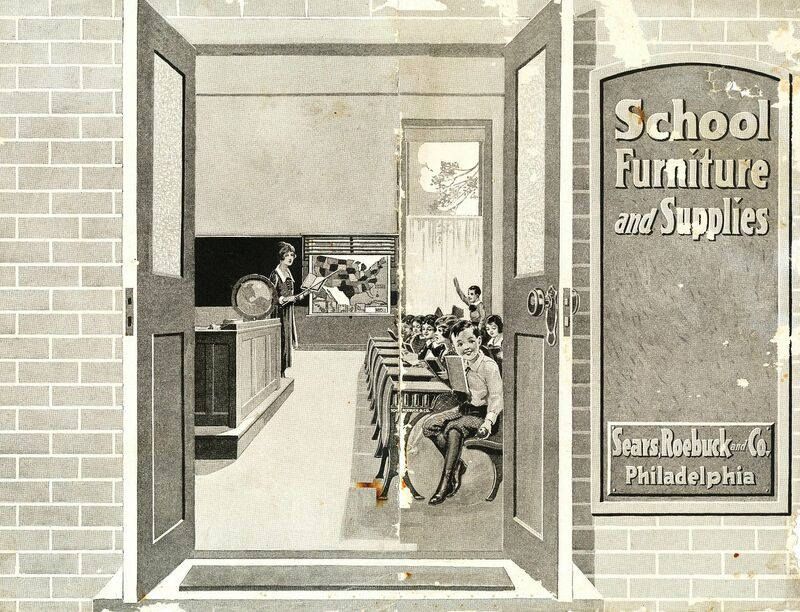 In the process of digging through many, many boxes of old specialty catalogs, I discovered this 1926 Sears and Roebuck catalog titled, School Furniture and Supplies. My 57-year-old husband browsed through the yellowed pages and said, “I remember those desks.” He grew up attending school in a small town in West Virginia. Apparently, they didn’t replace functional items like schoolhouses and schoolhouse equipment as fast as we did here in Hampton Roads. Recently we returned to West Virginia to visit his family and while there, we were treated to a tour of this old one-room schoolhouse in Arbovale, West Virginia. 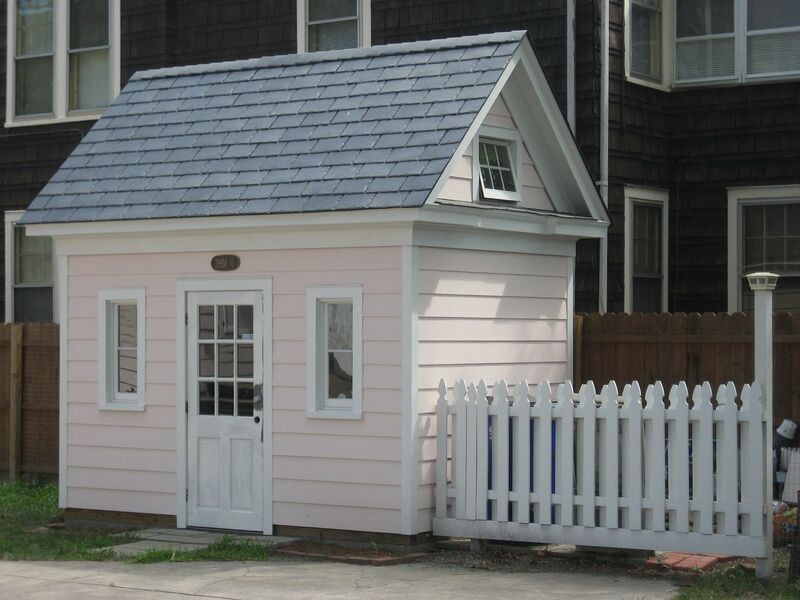 The small building is currently being restored by Wayne Gillespie (of Arbovale). It’s a beautiful little building! 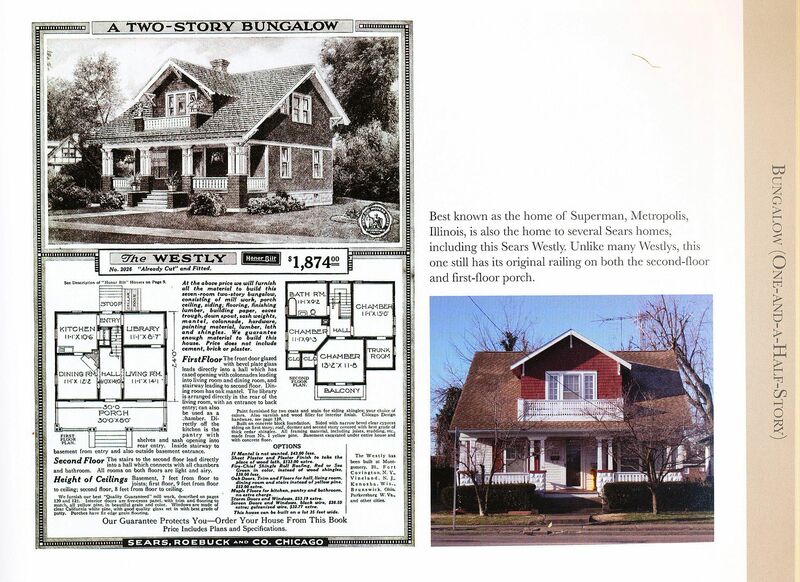 To learn about Sears Houses, click here. 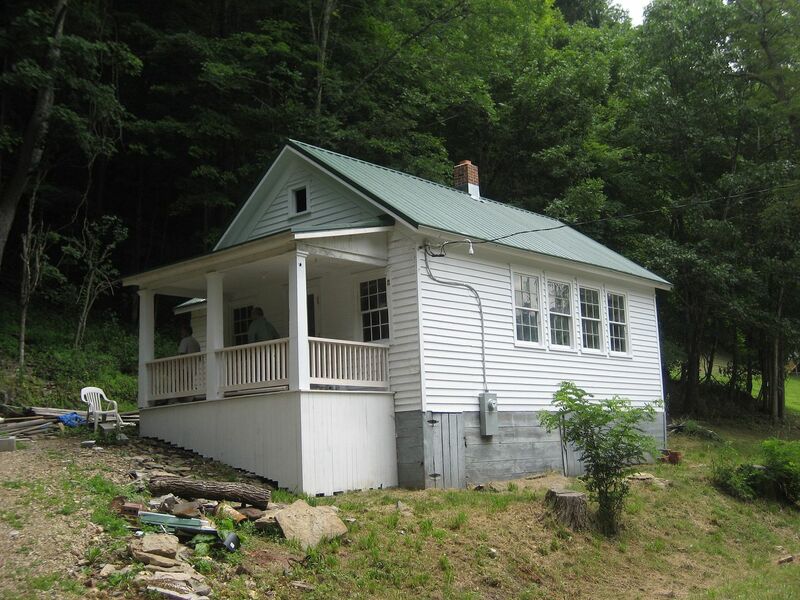 One-room schoolhouse in Arbovale, WV. When built in the early 1900s, this building probably contained many items from the Sears Schoolhouse catalog! 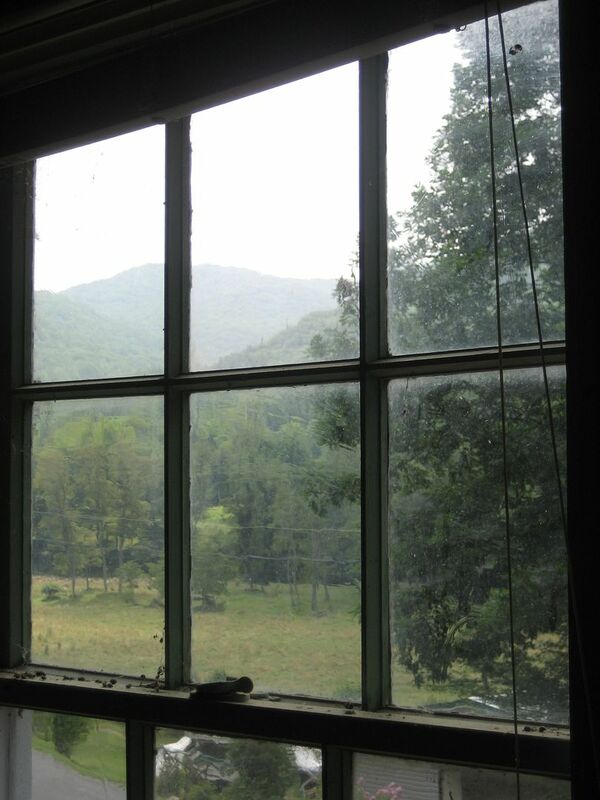 How many schoolchildren gazed out these windows, pining for the end of the day and longing to go play in these mountains! 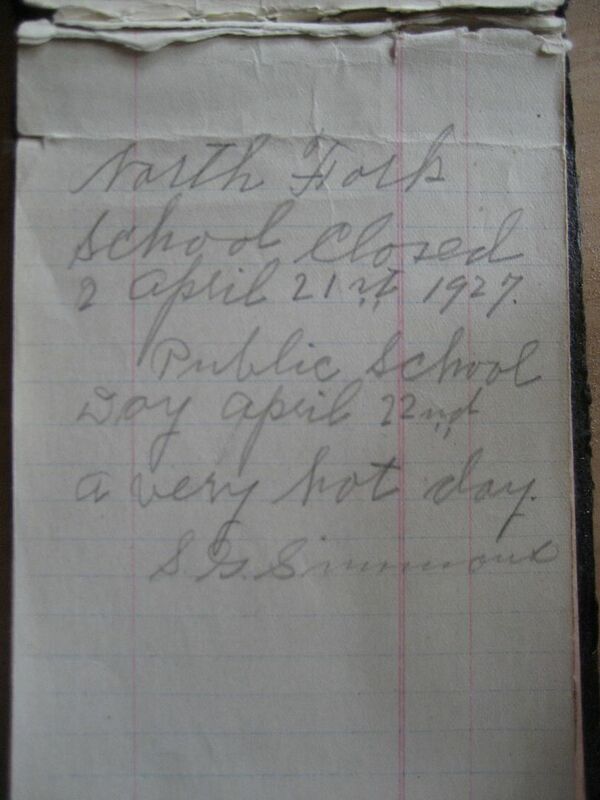 An old tablet found in the walls records the last day of school. 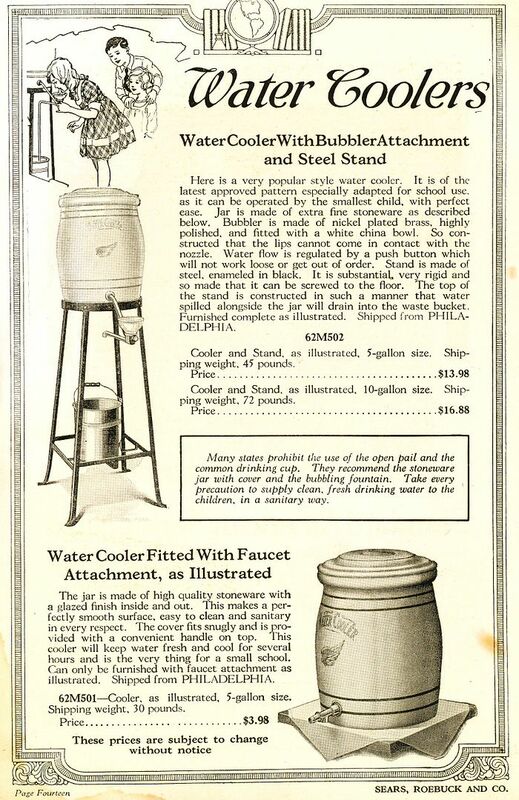 Sears Schoolhouse specialty catalog from 1926. 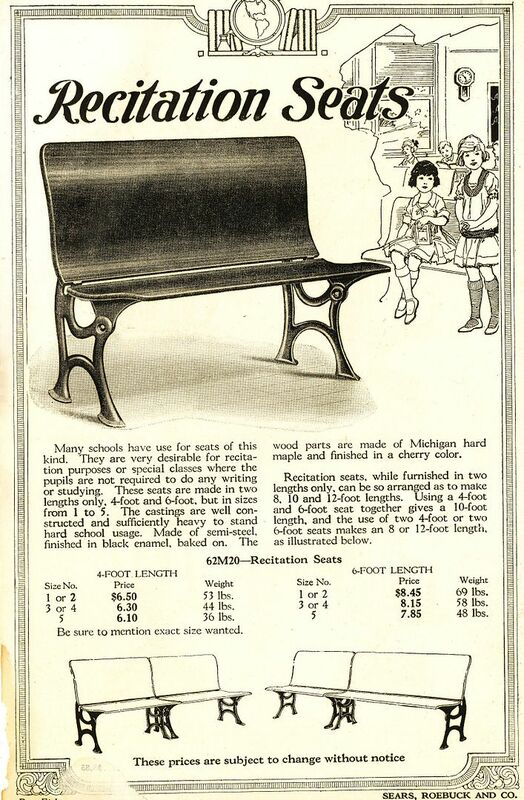 Sears Recitation Desks. Somehow, just hearing the word "recitation" brings back the "wearing nothing but undies to school and being asked to take a pop quiz" nightmare. Nice oak chairs for the teachers. And nice water coolers, too. 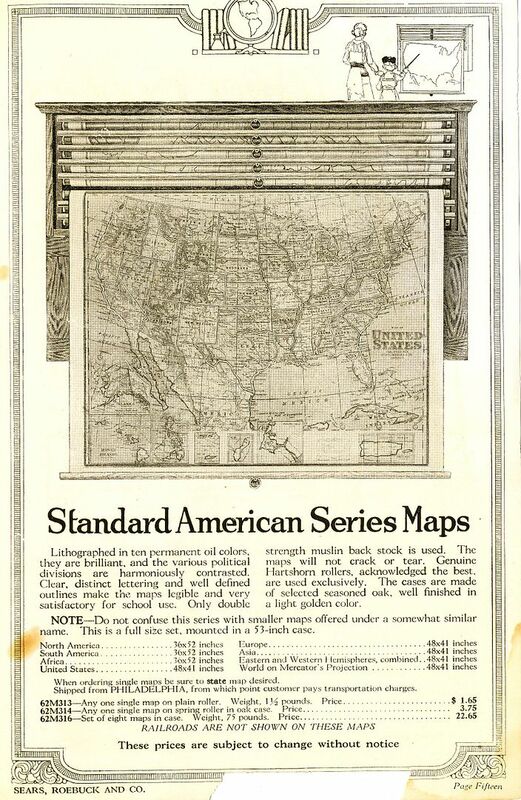 And nice maps of our 48 states. 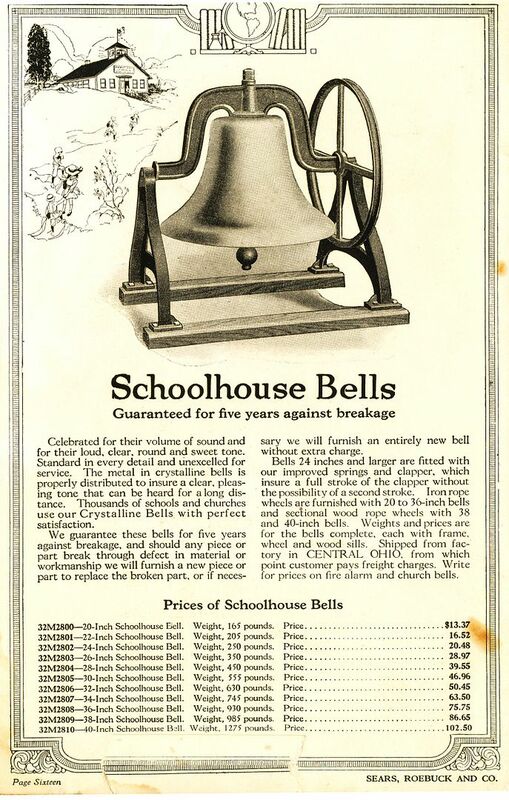 And of course, a school bell. To read another fascinating article, click here. To contact Rose, write thorntonrose@hotmail.com. 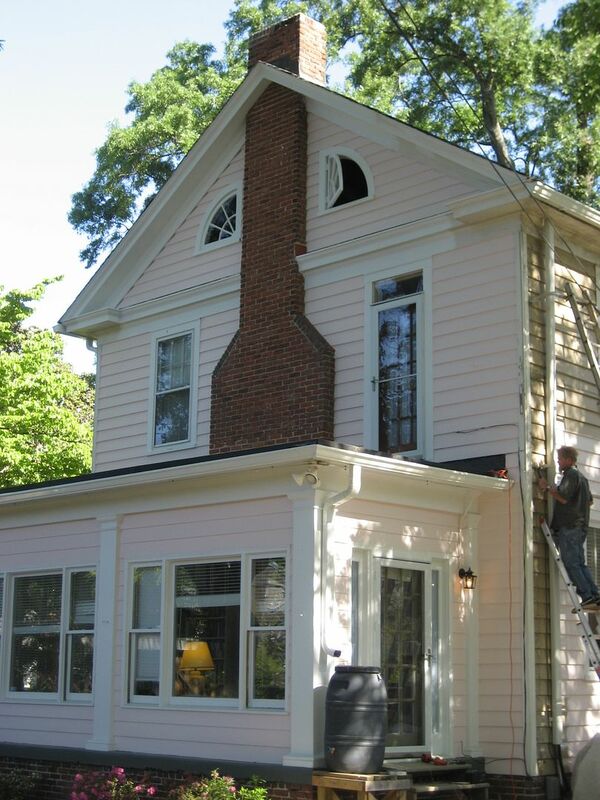 In March 2010, when folks saw the ladders go up on the outside of the house, they asked what color I was painting my house. More than a few raised their eyebrows. Tory Newman was the fellow who painted this entire house by himself, and did a BEAUTIFUL job. To contact Tory, call 536-5635. He is a true artist and a nice guy. 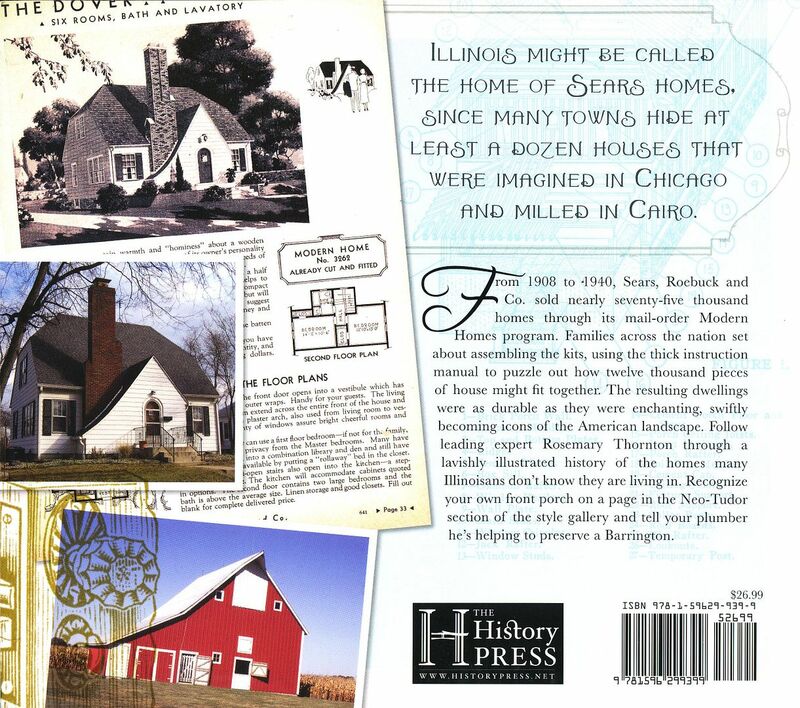 To read about the Sears Homes in Norfolk, click here. 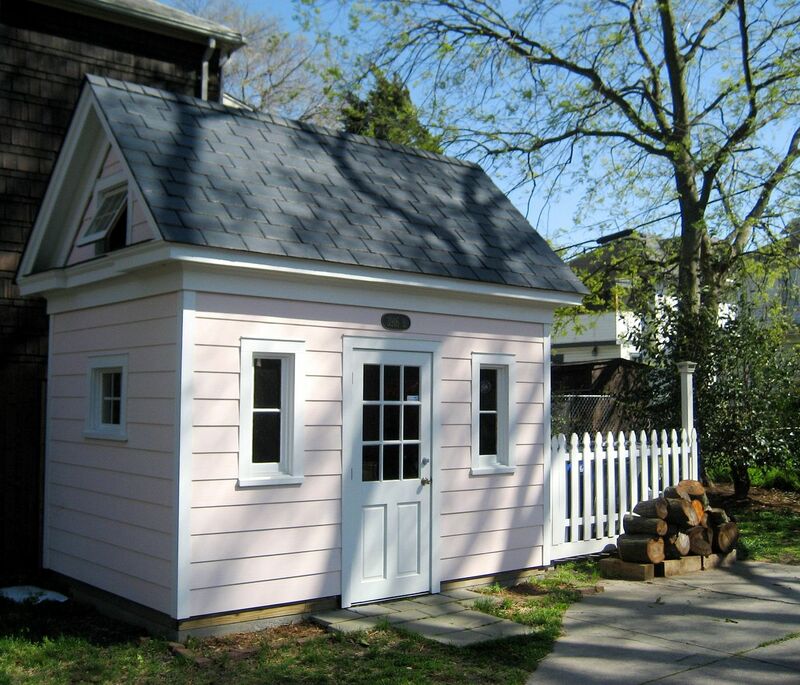 Last year, we sold our big pink house and moved to a smaller house. To see pics of the Ringer Ranch, click here. 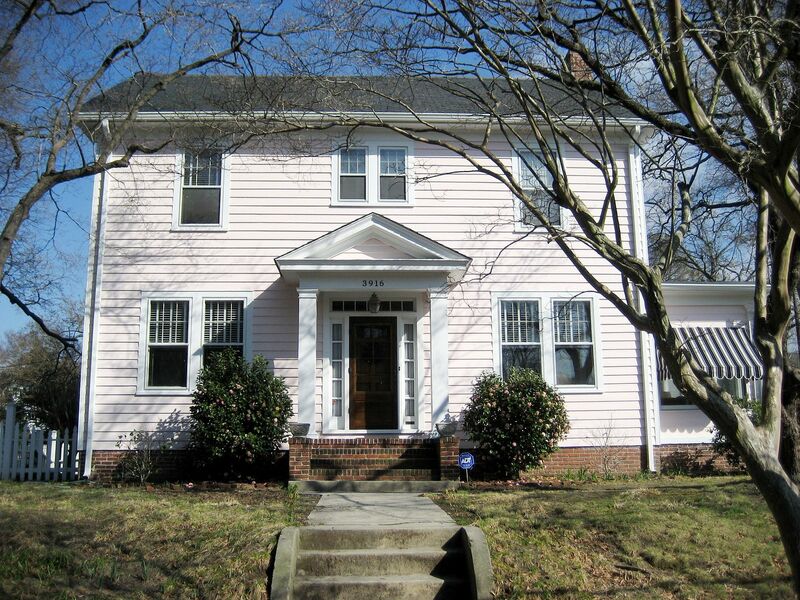 1925 Colonial Revival Home in Norfolk ,Virginia. 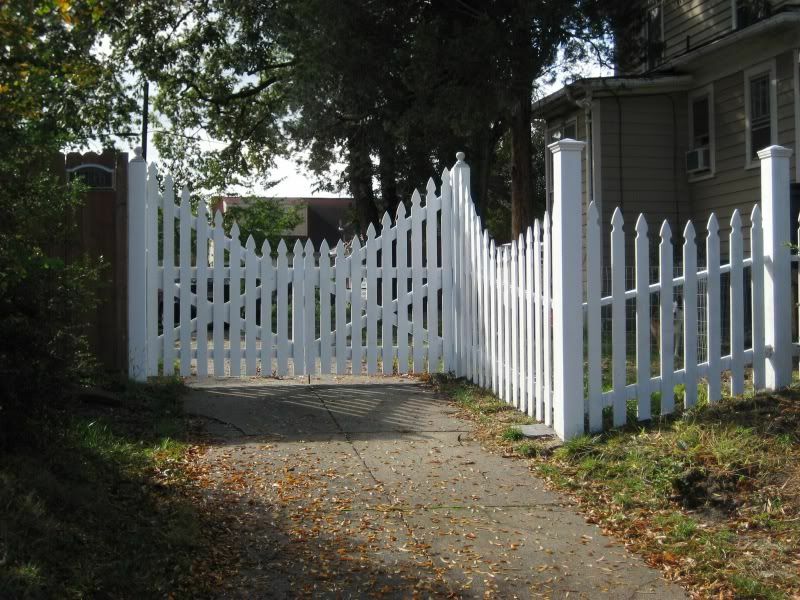 Picket fences go really well with pink houses. 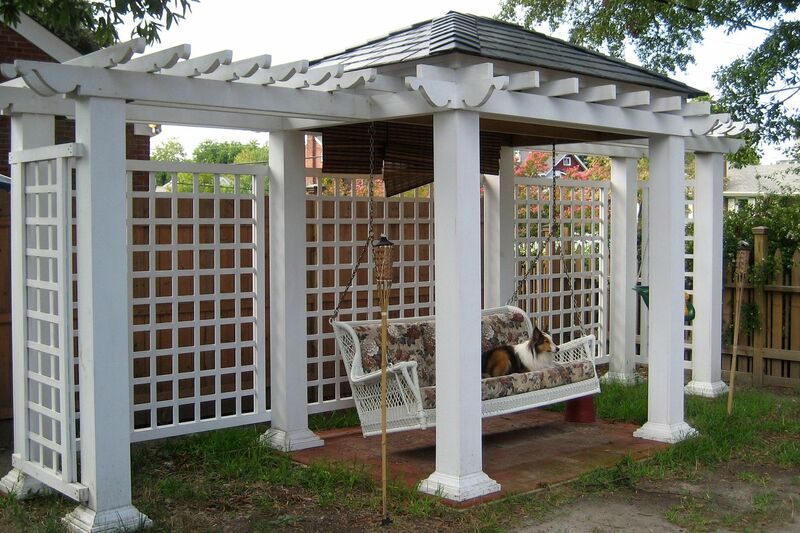 And of course, everyone should have a pergola in the back yard. Having given more than 200 lectures in 25 states, that is easily the most frequently asked question. No, but I live in a pink house that was built in 1925, and it’s a beautiful house, and that’s almost as good as a Sears House. 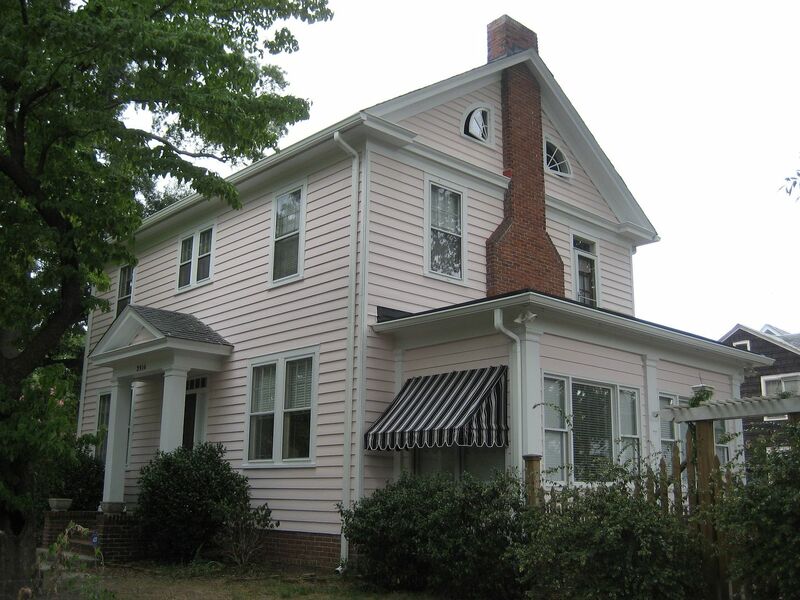 In Summer 2010, we had the house painted pink. I love it. Just love it, and that’s a good thing because this was an enormous project. We used more than 35 gallons of paint and primer (field and trim) and we chose Sherwin Williams Duration ($50 a gallon, 25 year warranty). Tory Newman did the job, and applied every drop of paint using a paint brush. No rollers, no sprayers, no watered-down-paint, just a first-class paint job done by a first-class painter who used all first-class materials. 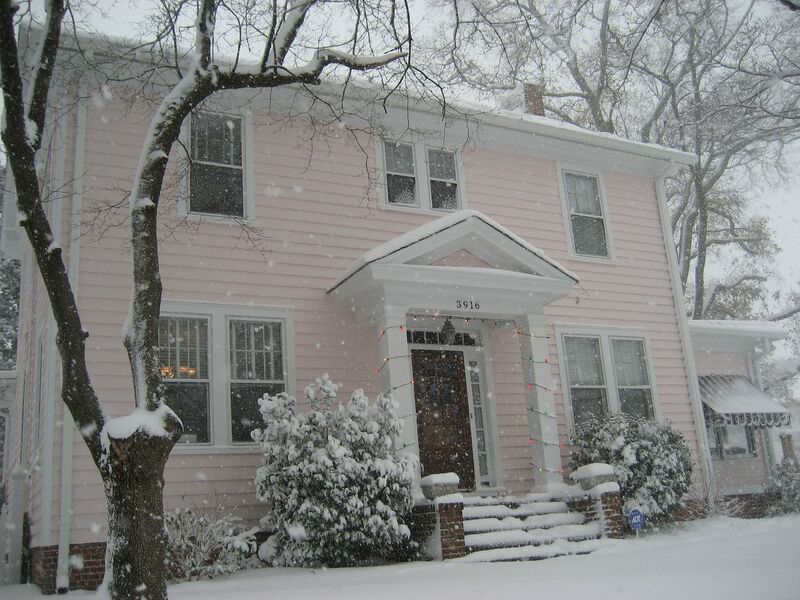 My 1925 Colonial Revival looks stunning in pink, and I’m quite certain that this is the prettiest house in all of Norfolk. My daughter says it looks like strawberry ice cream. My other daughter says it looks like a sheet cake. I think it looks perfect. 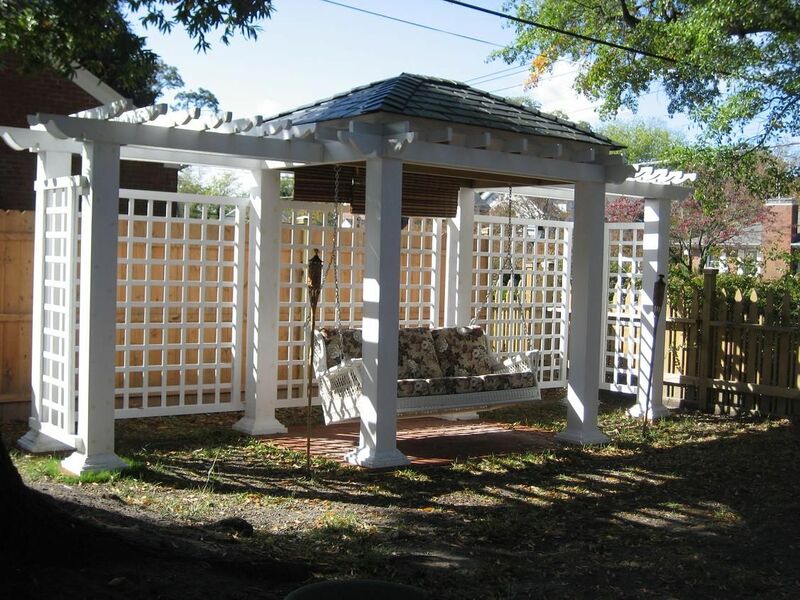 To read about the perfect pergola in the back yard, click here. The back looked worse than the front. It's likely the front had been repainted, but the rear had not. 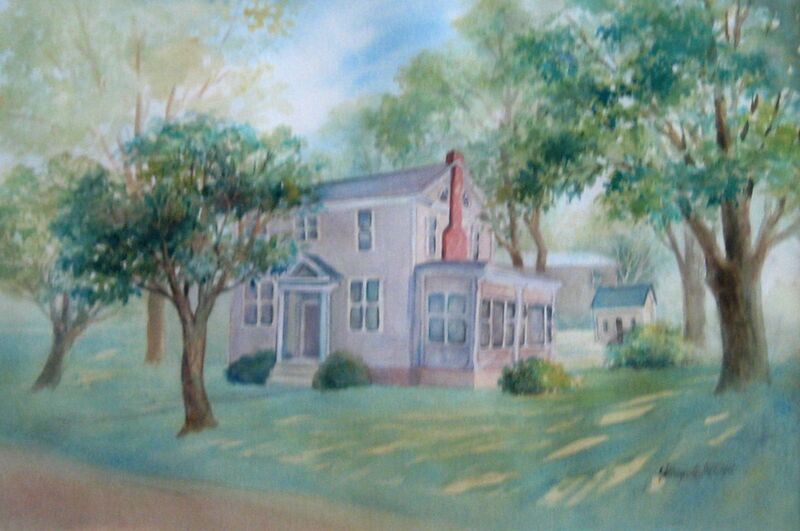 In addition to the painting (done by Kay Gillispie of Arbovale, WV), we’ve also been involved in the “Out and about Norfolk Plein Air Paint Out,” for the last three years, where local artists spend a day creating an artistic masterpiece of some Norfolk landmark. The second image came from such an event! 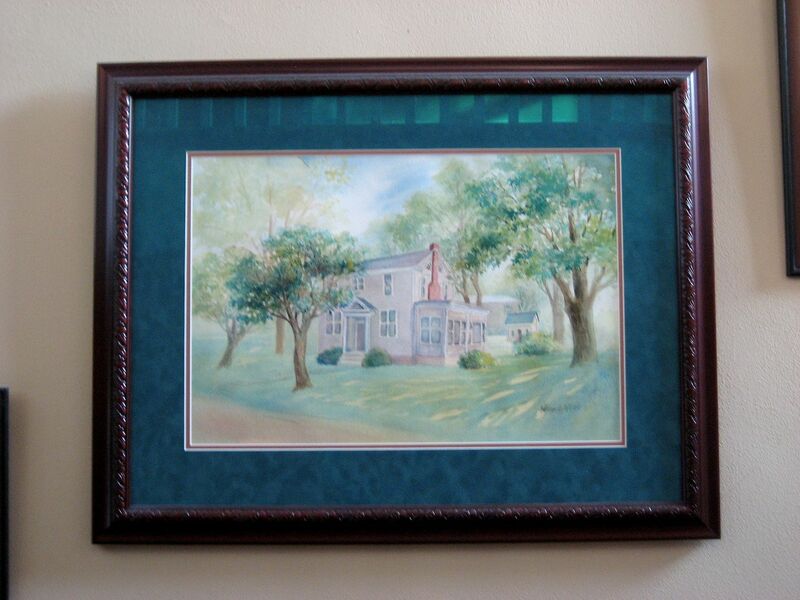 It is an oil painting done by Gina Warren Buzby. The third and fourth images were done by Morgan Sarah Ringer, and given to me as a gift. All four of these artistic works are among my favorite possessions on earth! 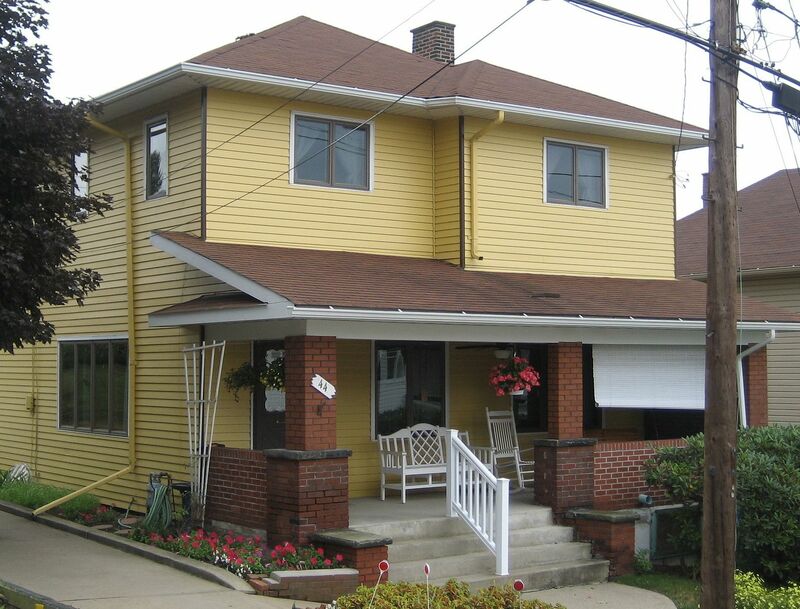 To learn more about our house, click here. 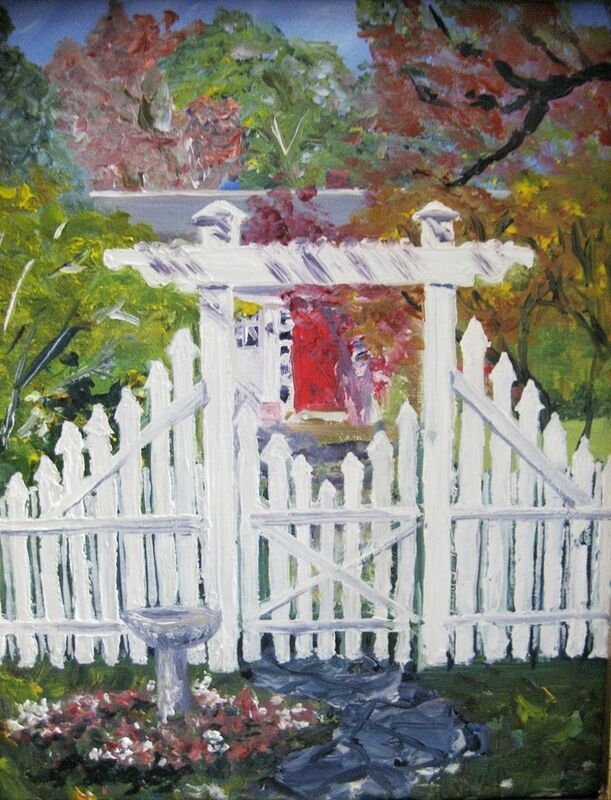 To see the pretty paintings, scroll on down! 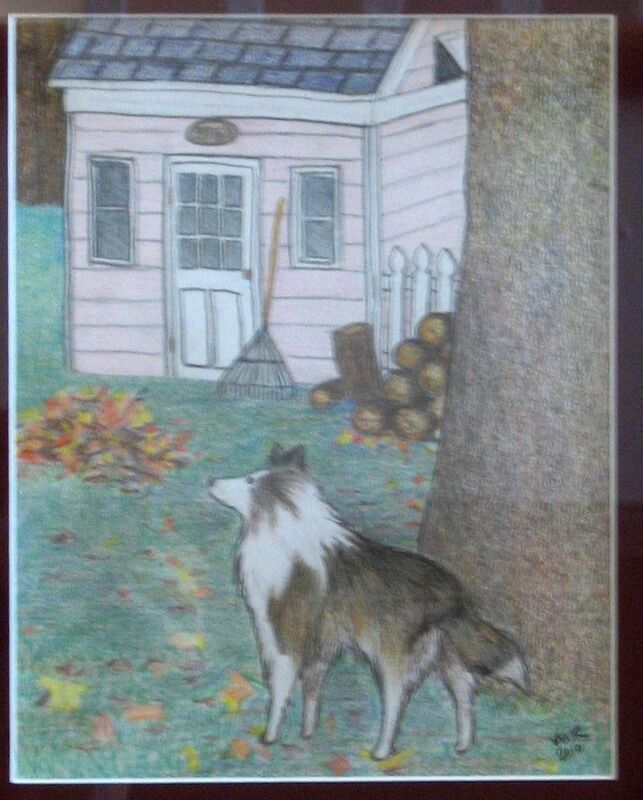 Kay Gillispie's beautiful artwork hangs on the staircase wall in our home. If you look closely, you'll see the little house in the back yard. And another lovely piece done by Morgan Sarah Ringer! 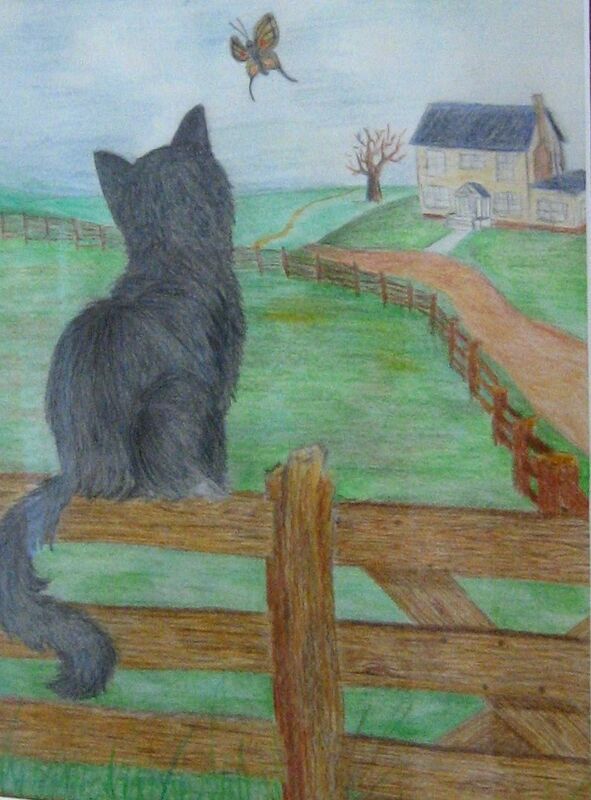 Morgan's rendition of Teddy the Dog staring down the little house! And my favorite "view" of the house is from this angle, which shows off those quarter-round windows and new canvas awning. 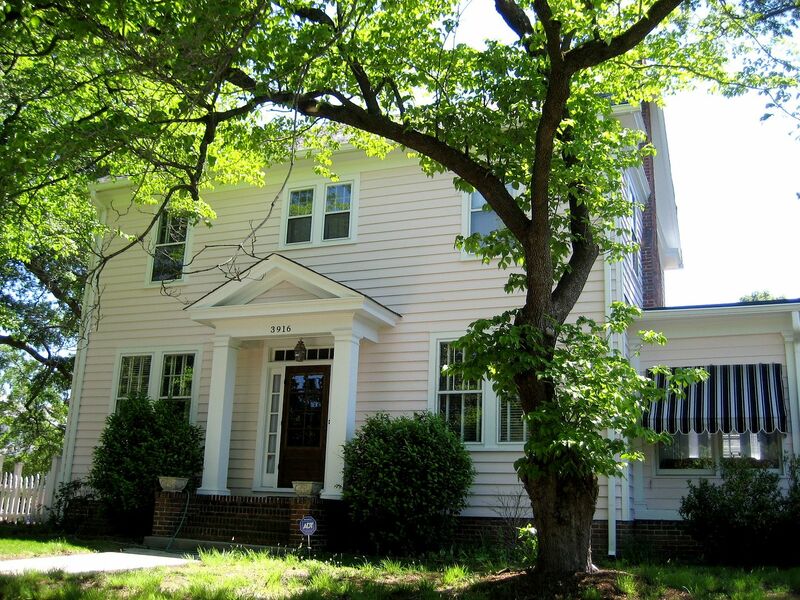 To learn more about 3916 Gosnold Avenue, click here. 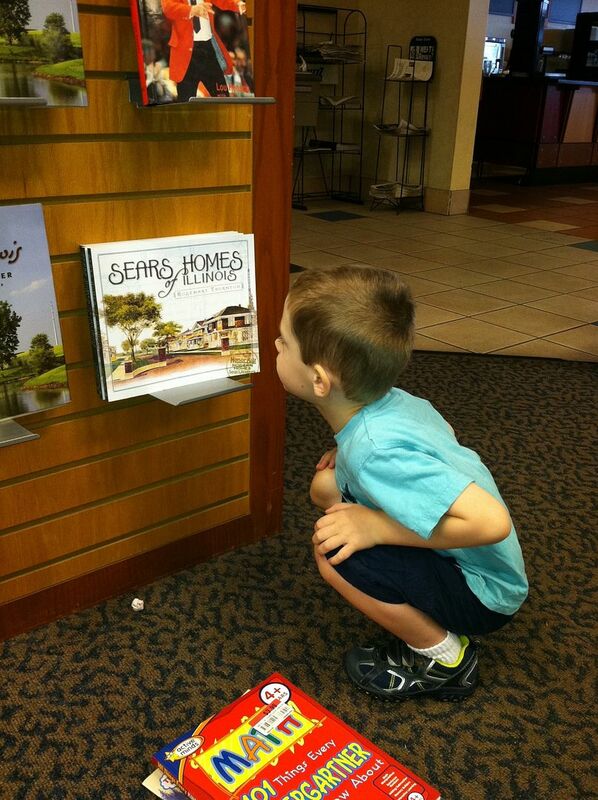 Elias Knows a Good Book When He Sees It! And I know a cute boy when I see one! 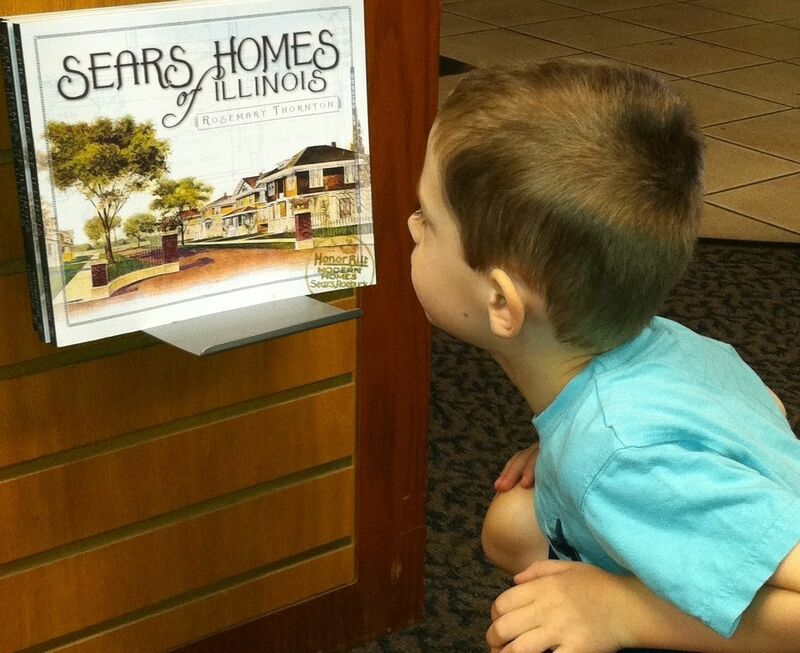 Elias and his mom were at the Borders in Champaign when they spotted my newest book on the shelf, and my daughter (Elias’ mom), snapped a nice picture for me. 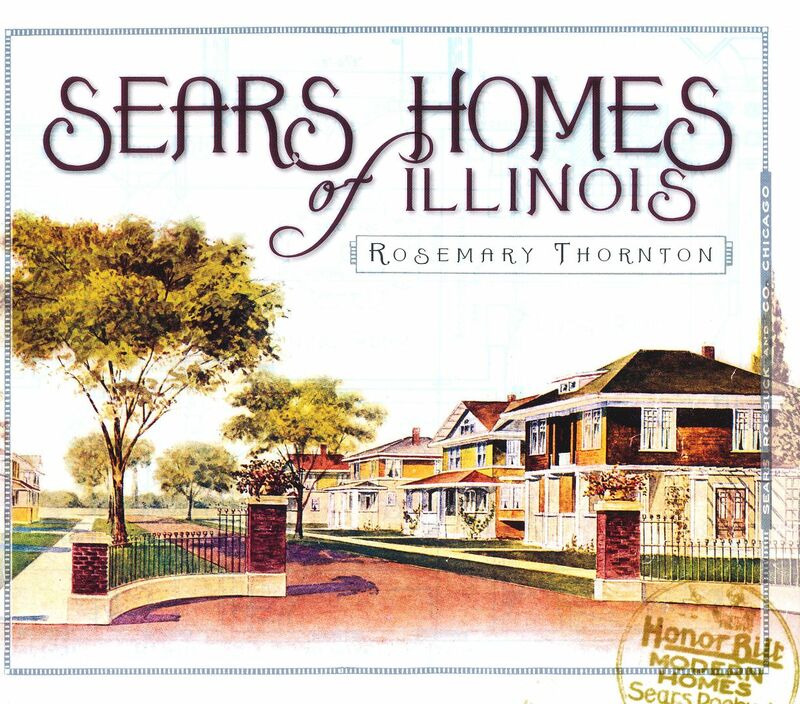 “The Sears Homes of Illinois” (printed late November 2010), has 250 color photos of Sears Homes, and of my eight books, this is one of my favorites. And a sample of an inside page. This dry dusty city of Norfolk, Virginia, has an ordinance that forbids sinking a well within 50 feet of any property lines. Since our house is centered on our 110′ by 110′ lot, that means the only place we could have a well is in the center of our basement. After I set up my first rain barrel, it didn’t take me long to realize that one 60-gallon rain barrel didn’t go very far during one of Tidewater’s hot, dry summers. It was a start, but I need more water. The next summer, I added more rain barrels, placing them under a downspout that produced copious amounts of water. The first year, my little rain barrels sat directly on the dirt, and I didn’t use them very much. They were too low, too muddy and the head pressure was abysmal. 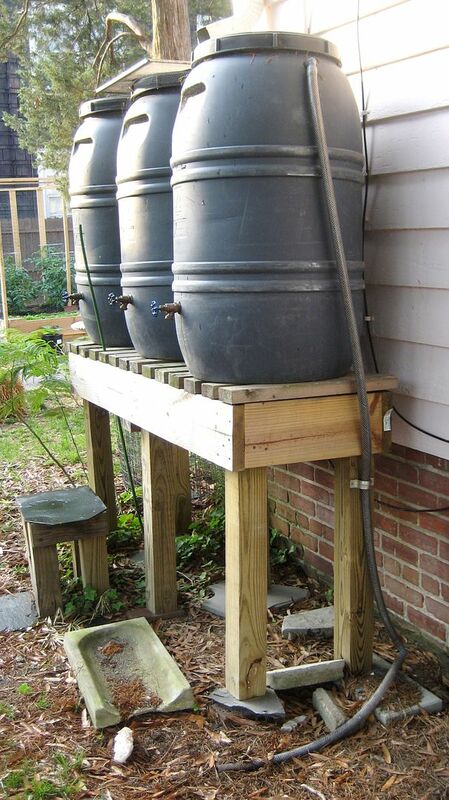 Later that year, I built a nice wooden stand for my rain barrels. The stand made it much easier to access my rain barrels, plus, the three feet of height gave them a little bit of head pressure, and improved water flow. And the 3-foot stand made it easy to fasten a hose to the spigot (a simple feat that was nearly impossible when the barrels sat on the ground). But back to rain barrels. There’s a sound financial reason for using rain barrels, too. 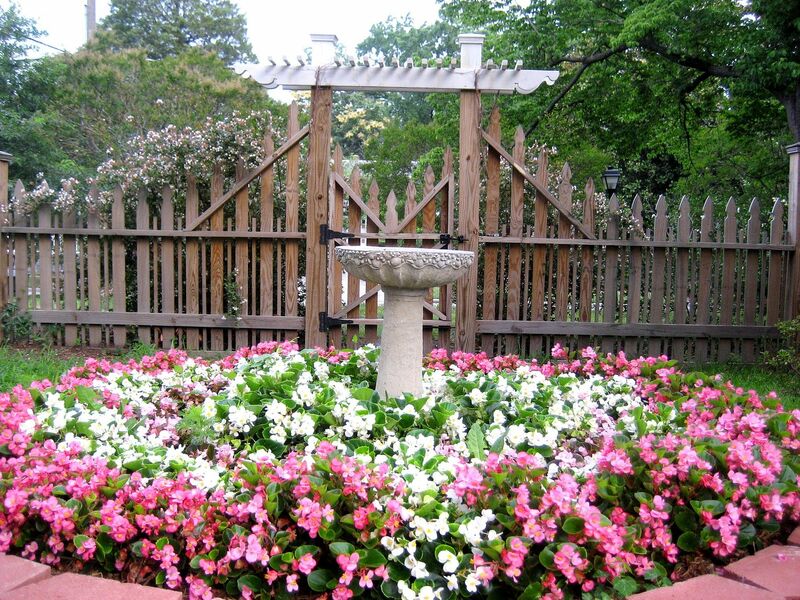 Experts say that 40% of our summertime water use comes from the outside spigot. In the process of using these rain barrels throughout the summer, I learned a lot of practical lessons. Below are the top 10 most important things I learned. 1) Height is important. For every foot of height you add to your stand, you’ll gain .43 psi of head pressure. If you could manage a ten-foot stand (not advisable for safety reasons), that’d give you 4.3 psi. From a practical matter, the three-foot stand (pictured above) put the spigot at the perfect height for me. 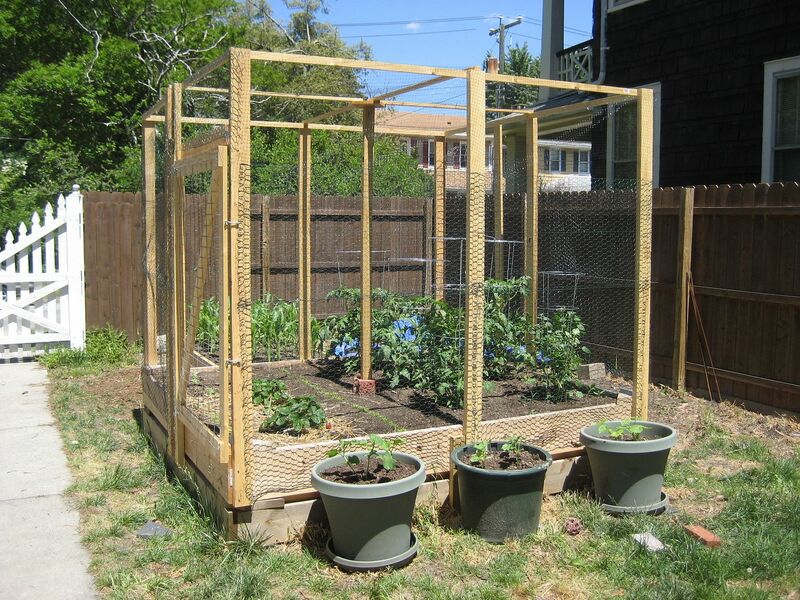 And if you’re working with a raised bed garden (like mine), you’ll need the extra height so that water can flow easily to your thirsty plants. My raised bed is 24" tall, so the three-foot stand is perfect. 2) Weight is also important. Water weighs about 8.3 pounds per gallon. Those rain barrels hold 60 gallons. That’s 498 pounds per barrel, and I’ve got three on one stand, so that’s almost 1,500 pounds of weight (when the barrels are full). That’s a tremendous amount of weight and you should plan accordingly when building your stands. This summer, when my barrels run dry, I’ll have to pull them down and add cross-bracing to the stands. You’ll note in the picture that they’ve started to lean hard to the left. Cross bracing would have prevented that. 3) Placement. My three rain barrels are located in my back yard, underneath a busy downspout. Water comes from the main roof (which is slate), flows down to the smaller roof and into my rain barrel. With 10-15 minutes of a good downpour, all three rain barrels are filled up full. The downspout on this side of the house produces a lot of rainwater. 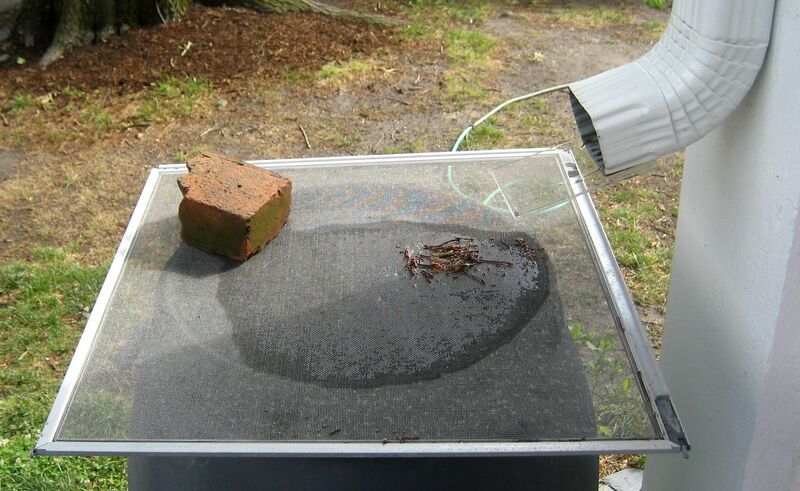 4) Pre-screen your rainwater. 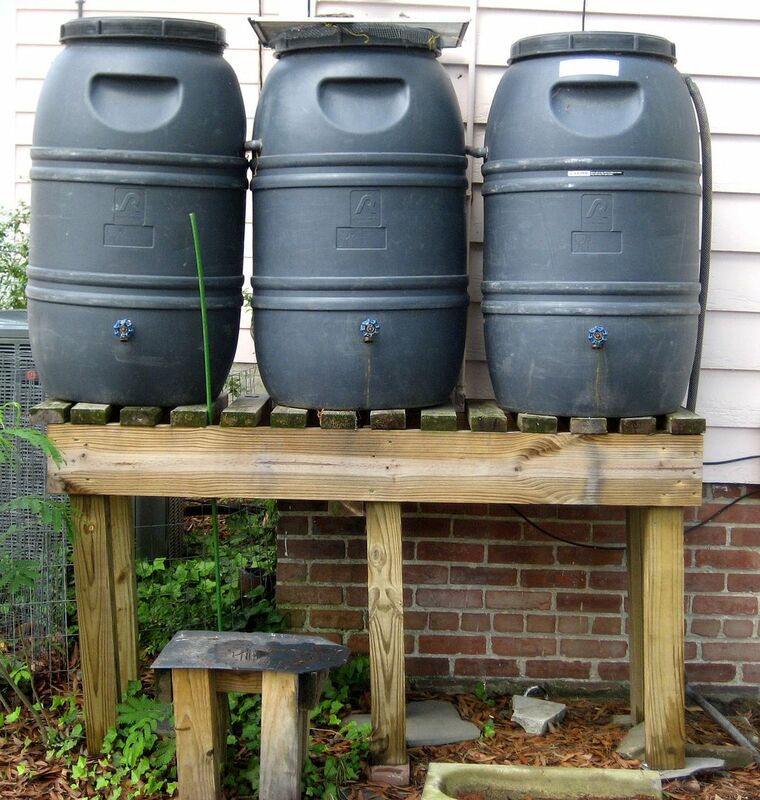 These rain barrels have a four-inch floor drain in their top, with a piece of mosquito screen affixed. Too many times to count, I’ve rejoiced as a summer storm pours rain from above, only to find that the four-inch hole became hopelessly choked with the debris from the gutters, and very little of that delightful rainwater actually entered my rain barrels. My solution to this was simple. I took the aluminum-framed screen from an old storm window and stuck it on top of the rain barrel. That solved my problem. The large surface area of the aluminum screen allowed water to flow even after that first pile of gunk came washing down the spout. And it's just an aluminum screen from an old storm window. The brick keeps it in place. My husband said this rig makes it look like Jed Clampett lives here, but it works. 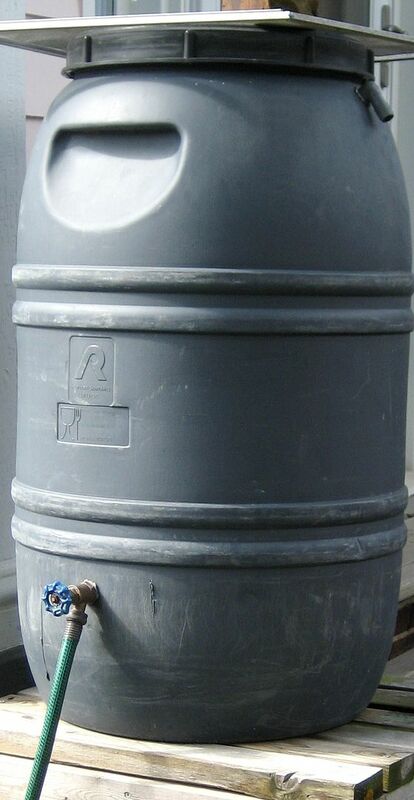 5) If you’re building/making your own rain barrel, put the spigot in the right place. 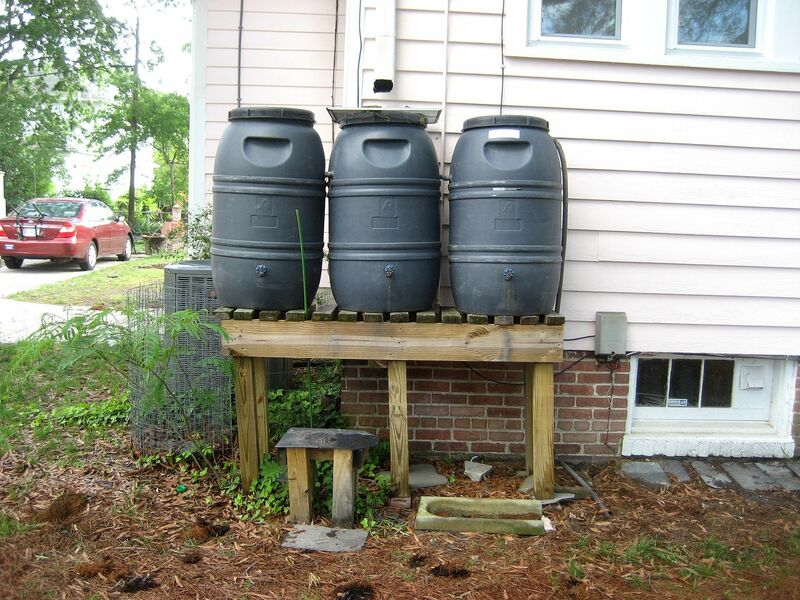 When my neighbor saw my rain barrels, he ran out and bought some materials and made his own barrels. Every single one of his five rain barrels has a spigot at the half-way point on the barrel’s side. This means that he’ll only be able to use 50% of the water in the barrel. Not a good design. 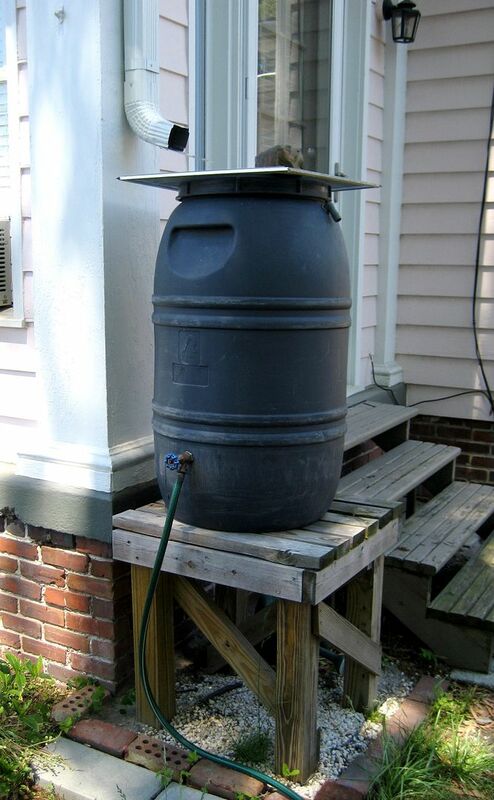 There are also entire blogs devoted to building your own rain barrel. The barrels shown here are food-grade olive barrels, used to ship olives here from overseas. Learn more here. 6) Don’t get bugged. Mosquitoes are naturally drawn to stagnant water and rain barrels provide the ideal breeding ground. Screens will stop some of that, but not all. One year, I had mosquitoes crawling in through my overflow pipe. Adding several drops of baby oil to each rain barrel will create an oily film in the water, and should stop mosquitoes from laying eggs in your rain barrel. 7) One downside to this rainwater fun is that you’ll now have to keep your gutters cleaned out. If all that precious rainwater is cascading over the front edges of your gutters because the downspouts are blocked, your rain barrels won’t do much for you. And if your house is sheltered by large trees (like mine), this can be a perennial problem. Trees are pretty to look at, but hard on gutters. When the barrel runs dry, remember to turn the spigot off. Sounds simple enough, but somehow, it’s so easy to forget this little detail. Many times, I’ve gone outside to check my rain barrels after a hard rain, only to find that I left the spigot open and all that rainwater went in through the top and out through the spigot. It's easy to forget to close the spigot when rain barrels run dry. 9) Maintenance. About once a year, I rinse out the rain barrels with city water. The bottom gets a layer of crud in it and the smell is horrific. I’m not sure about the microbiology of all that decaying matter, and maybe it’s just dandy for the garden, but the stench will knock your socks off. 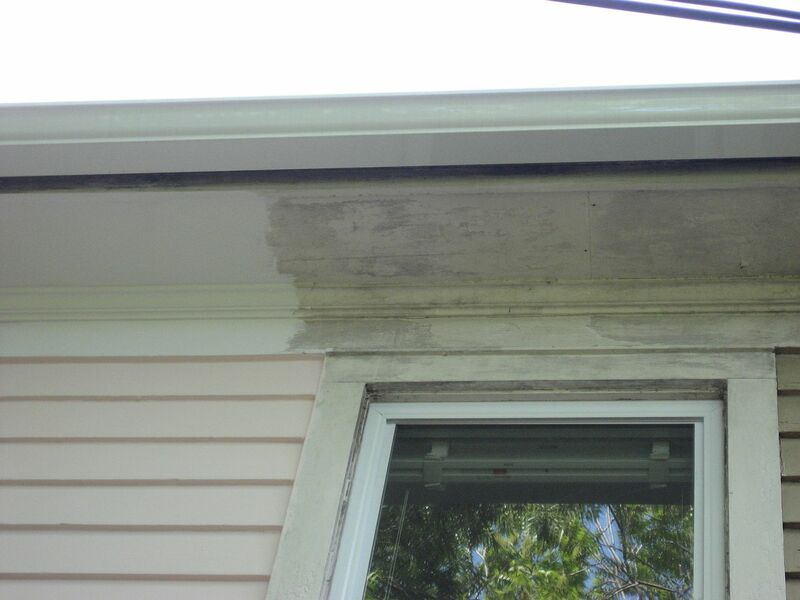 10) Keep water away from the foundation. A surprising amount of water can be discharged through your overflow pipe. Make sure that water is directed away from the house. I keep meaning to put that downspout spillway *under* the overflow hose. 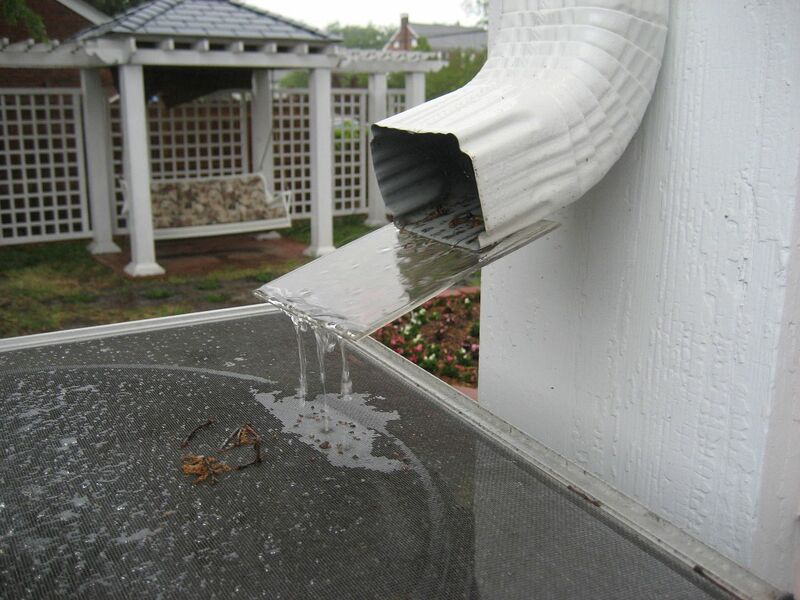 11) Your downspout might not quite hit the sweet spot on the rain barrel. 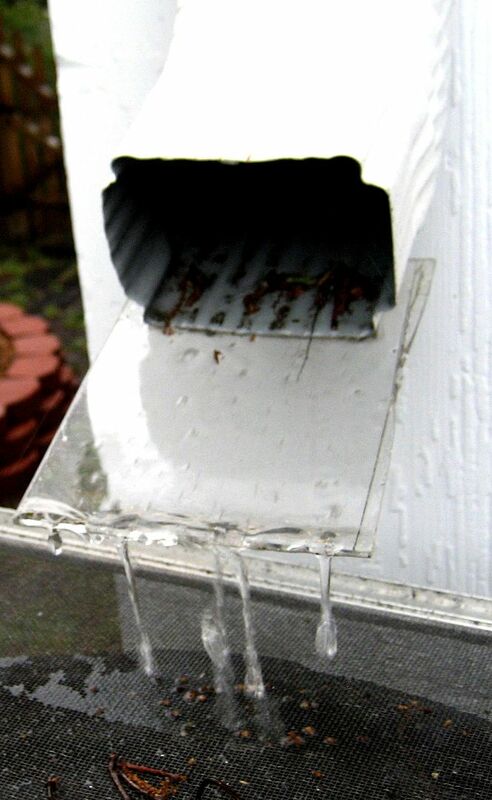 A little extra piece of aluminum downspout is probably the simplest solution. I used a piece of Plexiglas, which also does the job nicely. 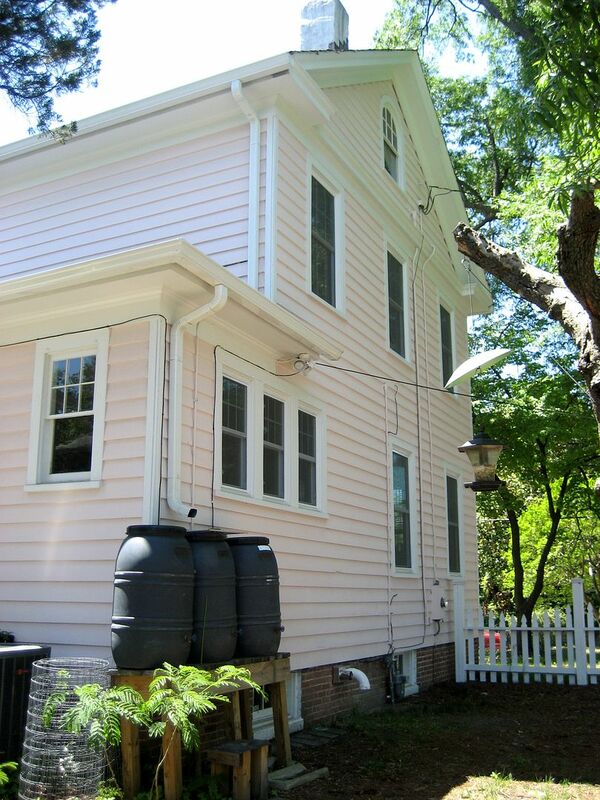 You might need to add a little extender to the downspout to reach your rain barrel. 12) If a drought hits, and you don’t want to use chlorinated water on your lovingly maintained and chlorine-free tomato plants, you can fill one rain barrel with city water and let it sit for several days. The chlorination will dissipate in time and you’ll have chlorine-free water. 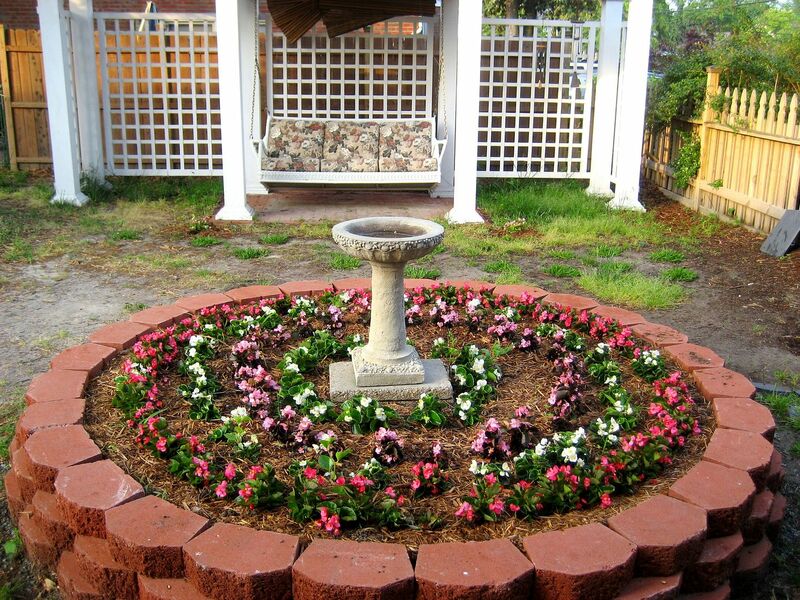 This isn’t the ideal, but in a pinch, it’s one way to keep your garden chlorine free. 13) Use a good quality hose, so you don’t go stark-raving mad. A cheap hose will kink repeatedly, and because the pressure is so low on water flowing from a rain-barrel, this kinking problem will be 50 times worse than it would be with city water delivered at 60 psi. 14) Enjoy. I’ve had a lot of fun playing with my rain barrels. And look how my garden grows! 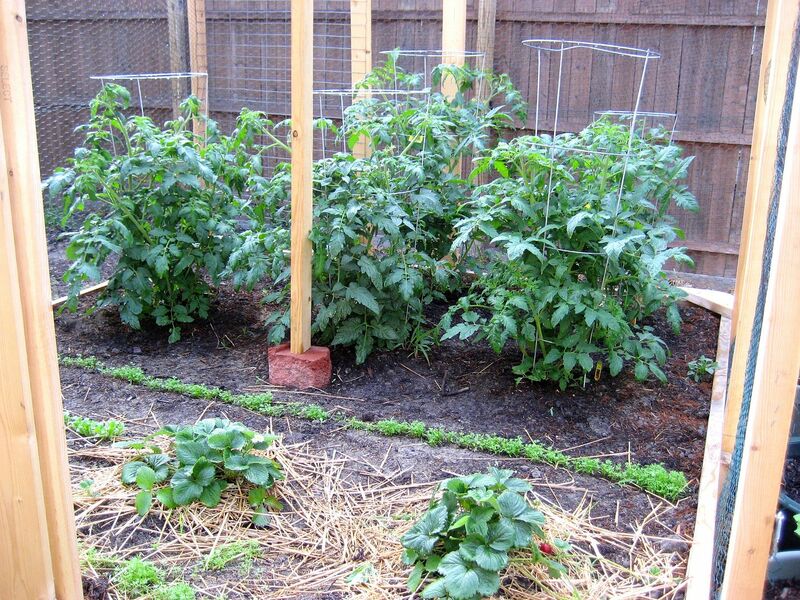 Tomatoes, strawberries and carrots share living space. 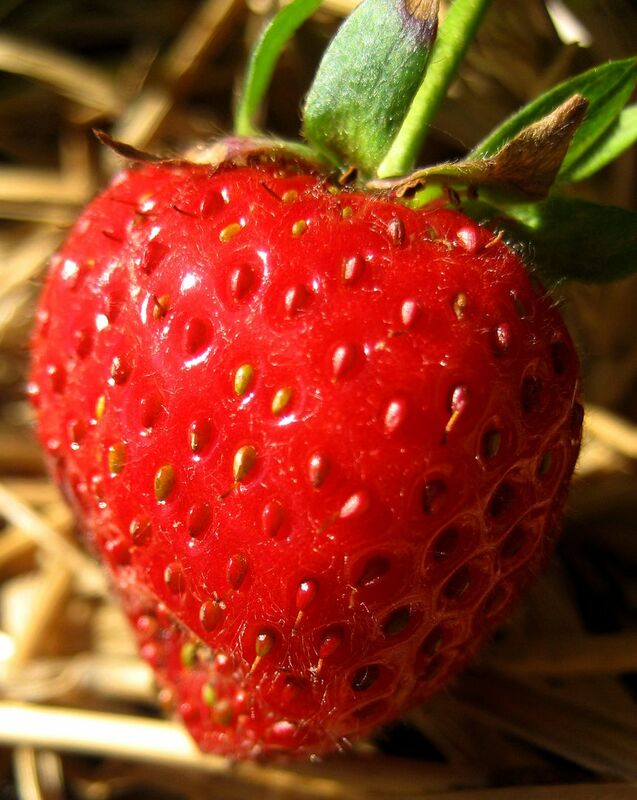 And the world's most perfect strawberry, from my garden. When we were kids, we’d sing this little ditty. If you’re in Hampton Roads, I highly recommend “Mike’s Rain Barrels.” Mike, the owner of this small business, is knowledgeable, customer-service oriented, friendly and thorough. Best of all, his prices are very affordable. You can contact Mike via email at mminor1959@verizon.net or call (757) 761-1553. The best part - he’ll deliver your rain barrels in his Toyota Priuss. 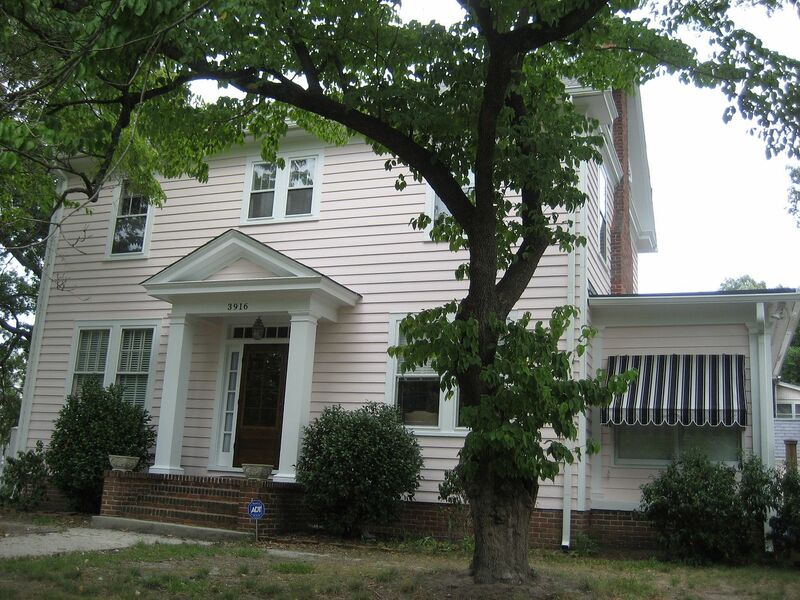 My Pretty, Pretty Pink House - For Sale! 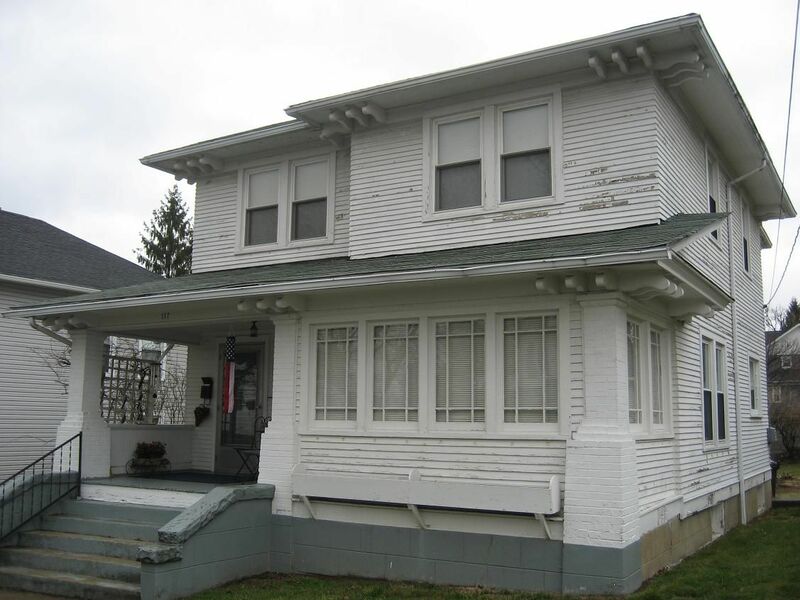 It’s a grand old house filled with the most modern technologies - and perhaps best of all - it’s priced about $60,000 below the current city assessment. 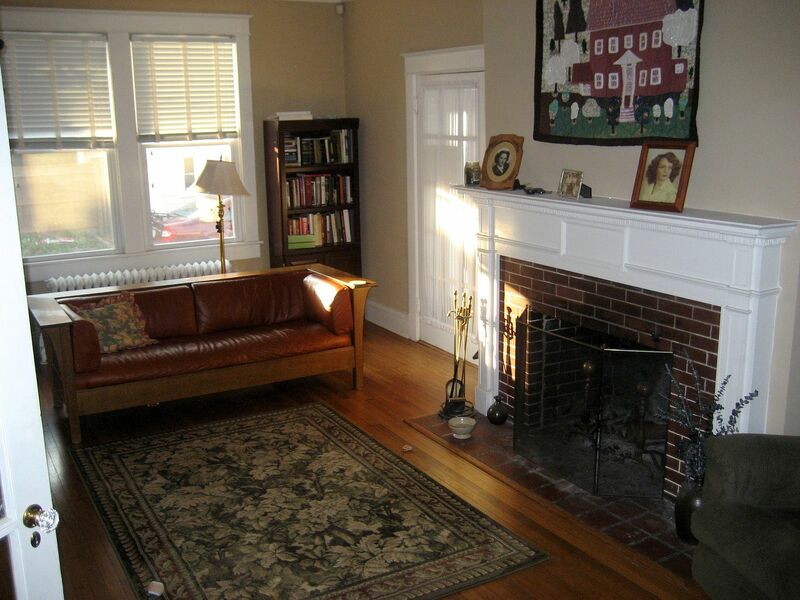 Even if you’re not in a market for an old house, take a moment and enjoy the photos! Updated: This blog was created July 24, 2011, and yet this remains one of the most popular blogs at this site. Every day, a couple dozen people come to THIS blog. 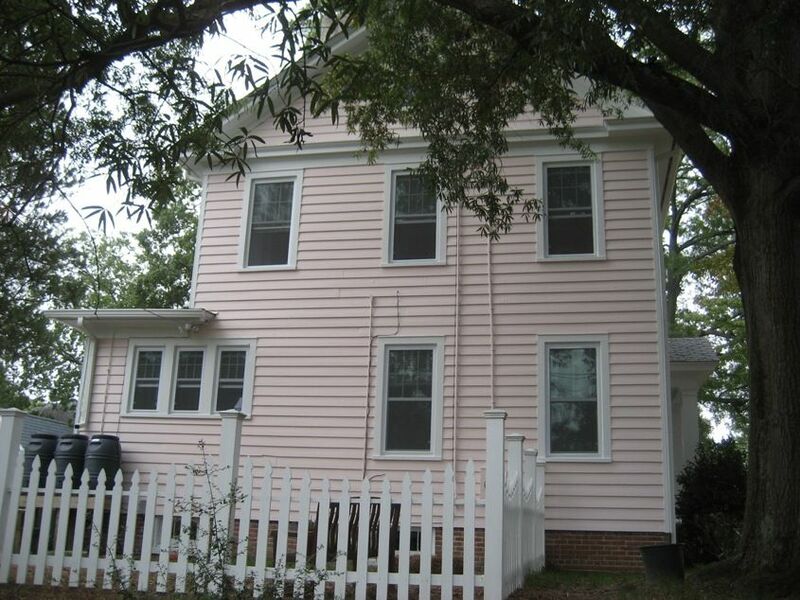 My beautiful pink house sold (and closed) on August 14, 2011. Every day of my life, I’m profoundly grateful for my “new” house, a 1962 custom-built brick ranch. To read about the new house, click here. And please, take a moment and please leave a comment below. What is it about this particular article that you enjoy? My favorite angle is the side, which shows off those quarter-round windows and new canvas awning. Dappled afternoon sunlight complements the front of 3916 Gosnold. 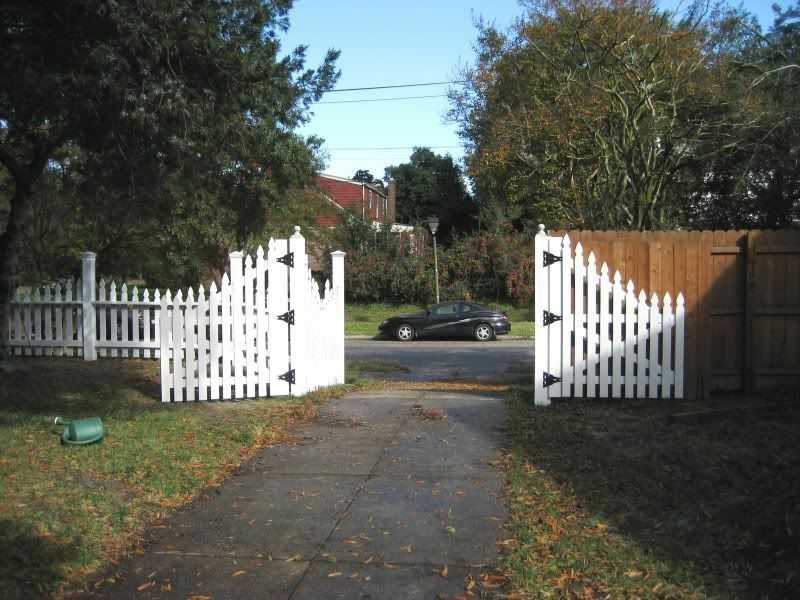 The gated entrance to my secret garden! And on the other side of the gate you'll find bowers of flowers (blooming in the sun). Something this old house hasn't seen in a long time - GRASS in the sideyard! 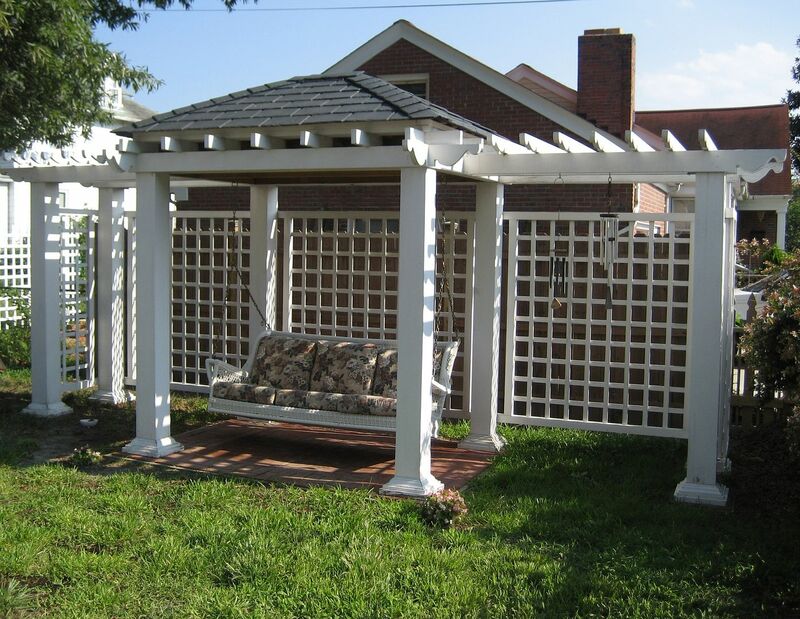 The pergola is pretty nice, too. My daughter said we didn't have enough views of the inside, so I took some additional photos! View from the living into the foyer and dining room. 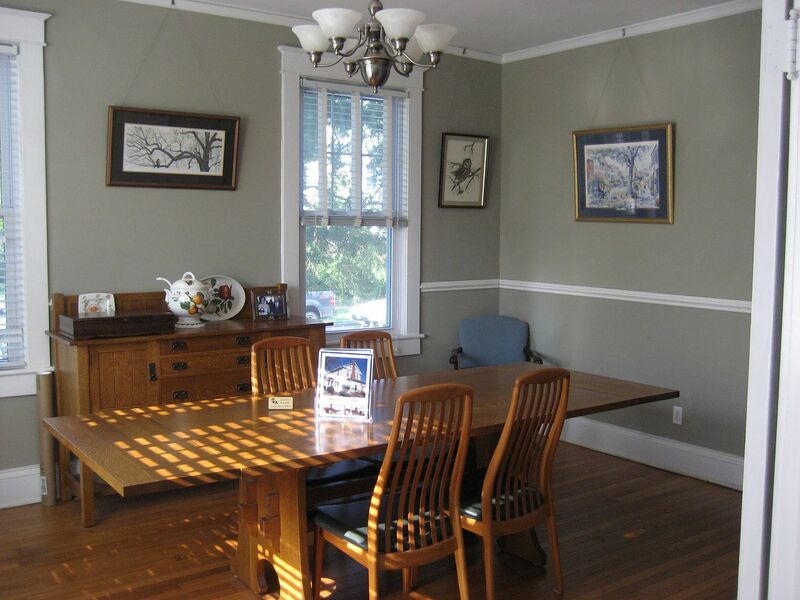 The setting sun illuminates the formal dining room, which measures more than 13 x 17. 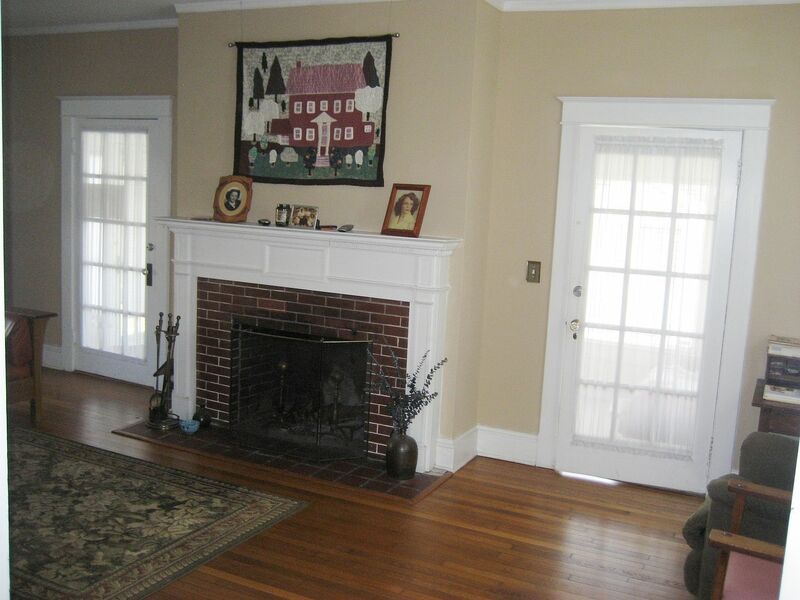 The formal living room is 13 x 23 and is always awash in light. 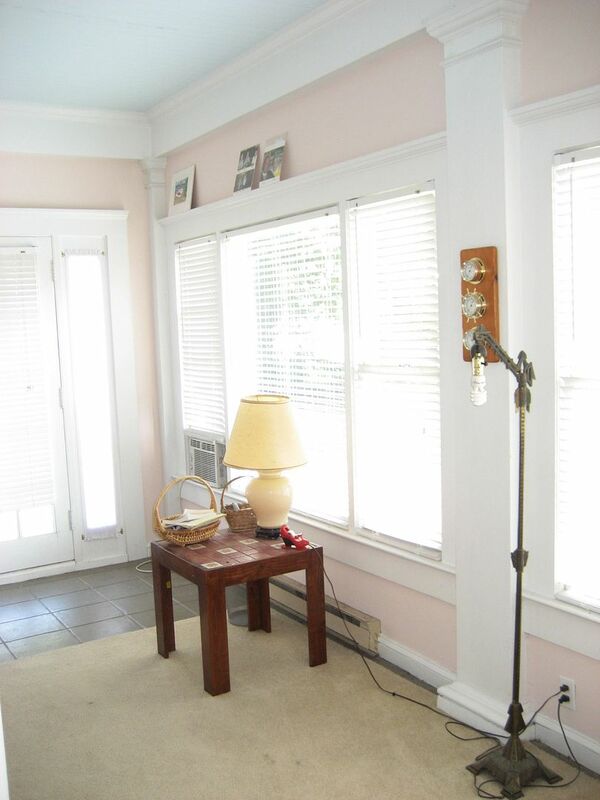 And the sunporch - one of my favorite rooms in the house! Kinda wish I'd moved that old floor lamp before I took the photo! 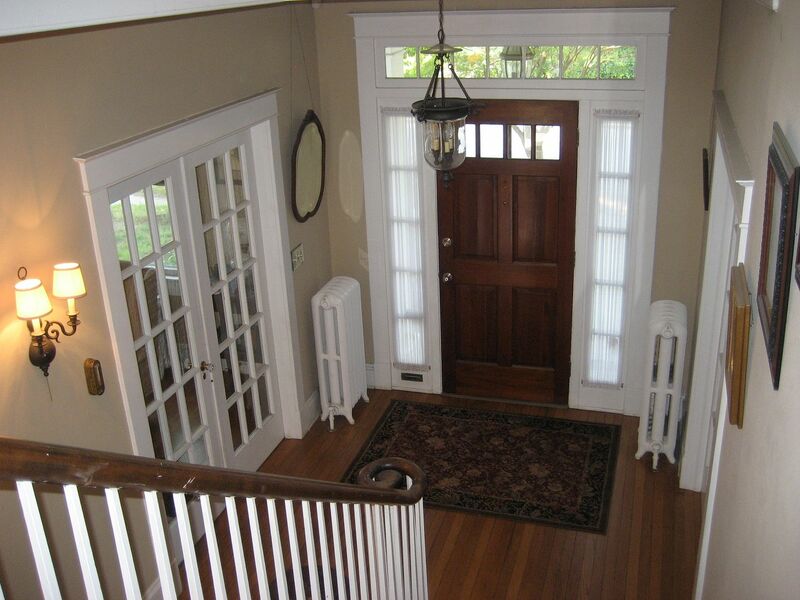 View from upstairs - looking into the foyer. 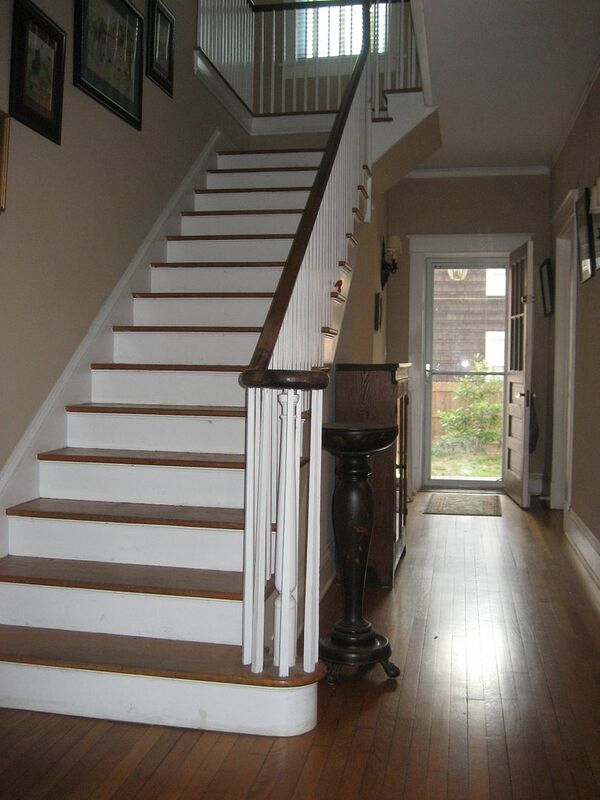 The staircase has solid walnut banister and tapered spindles. 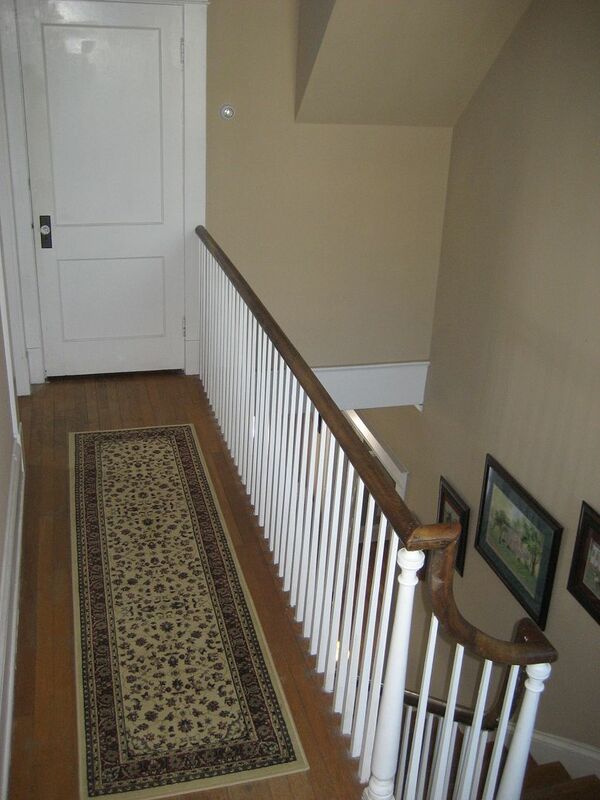 Upstairs hallway. Door at the end leads to the third floor. 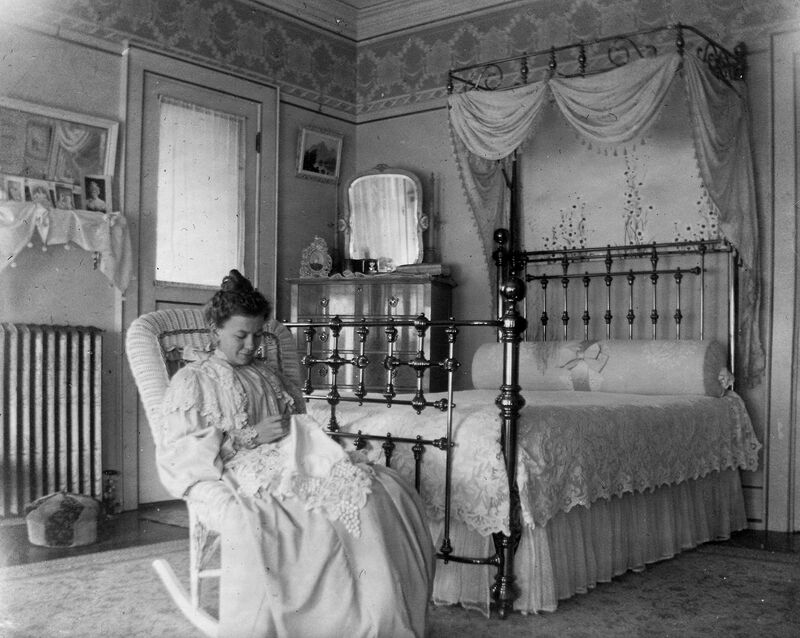 One of the three upstairs bedrooms. The door leads out to a balcony (over the sunporch). 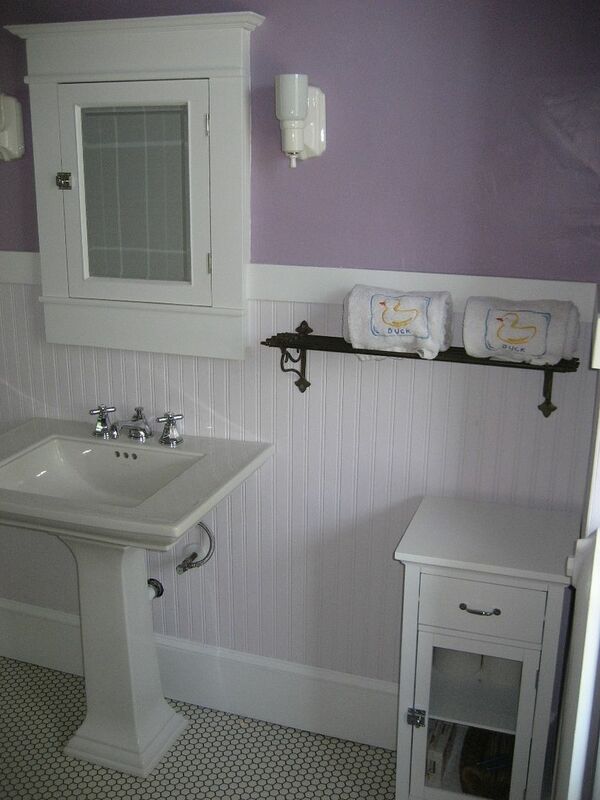 The bathroom was restored to its original 1920s appearance. Notice the hex tile on the floor. 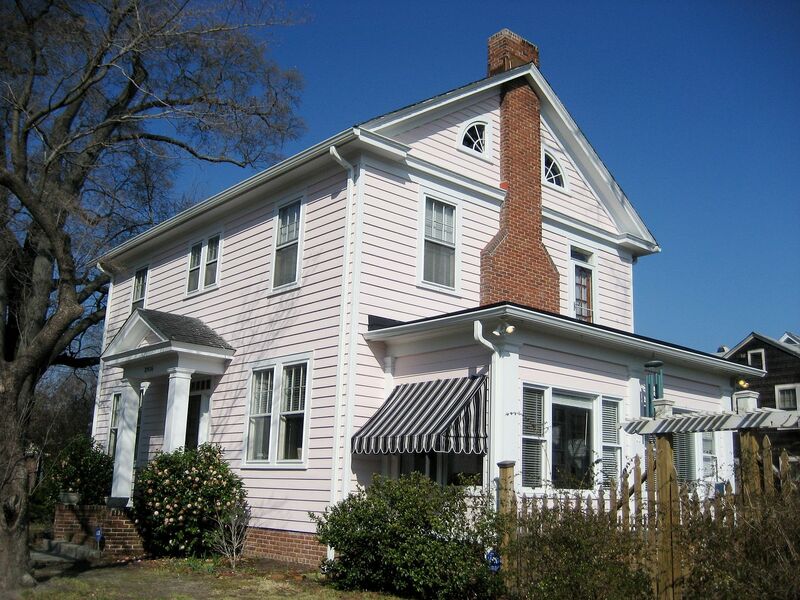 This old pink house has been faithfully restored to its original splendor, and has a high-efficiency gas boiler (94%+), high-efficiency central air (14 SEER) and a dazzling rainwater harvesting system. Enjoy the best of old-world craftsmanship together with the latest and greatest of modern technology. In short, you’ll have the unique pleasure of living in a beautiful old house with none of the environmental guilt. 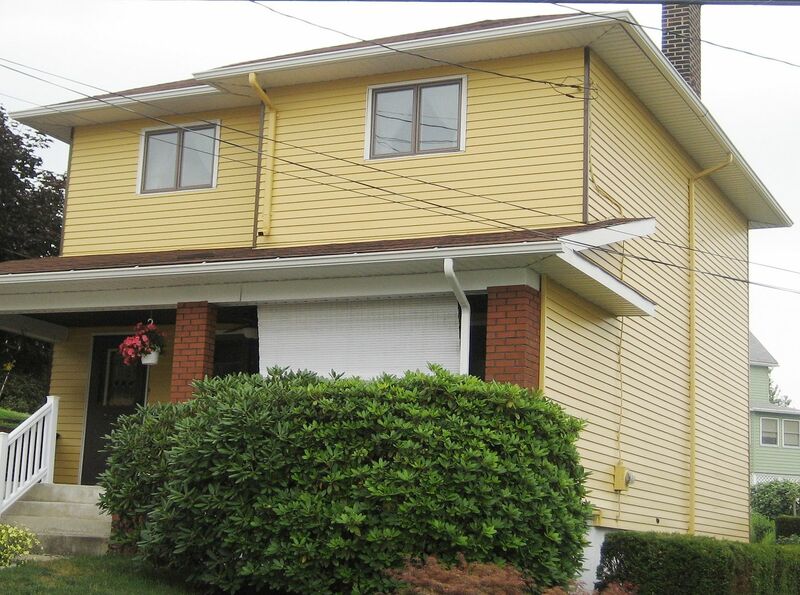 House is 2,300 square feet with three bedrooms, 1-1/2 baths, with a large sunporch, full third floor and awesome basement. Price is $287,900 with $4,000 closing cost assistance. If you’re interested in scheduling an appointment please contact the Realtor. 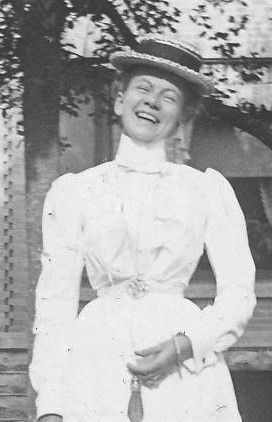 To read about Aunt Addie’s murder in Lake Mills, click here. 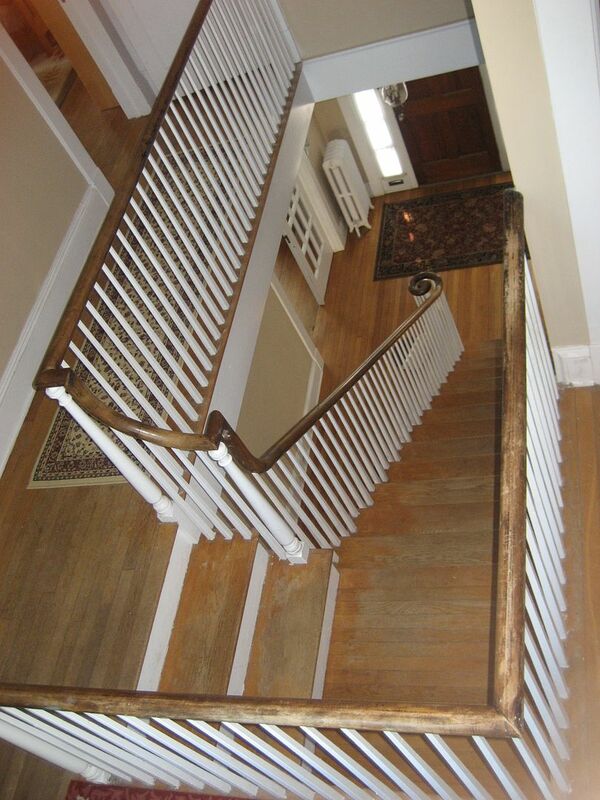 The house on Gosnold is a classic Colonial Revival, right down to the details. 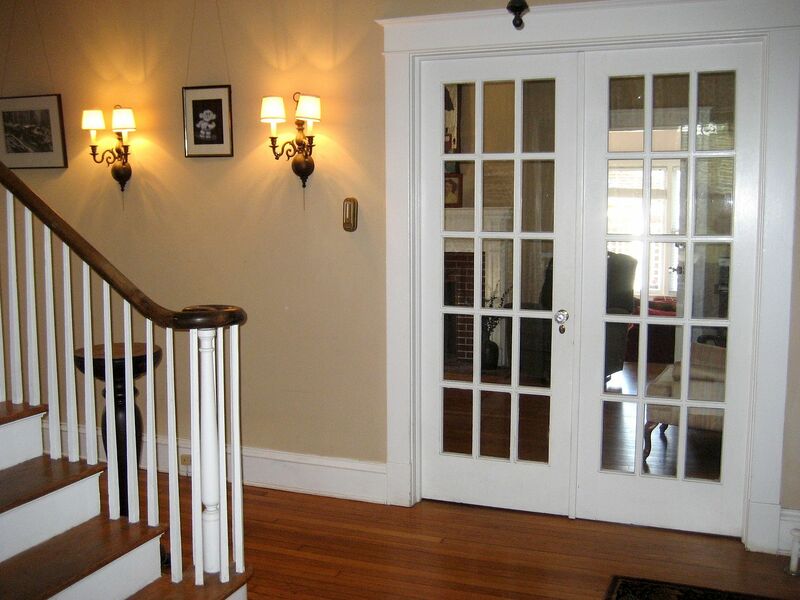 The image on the left is the entry foyer at Gosnold Avenue. 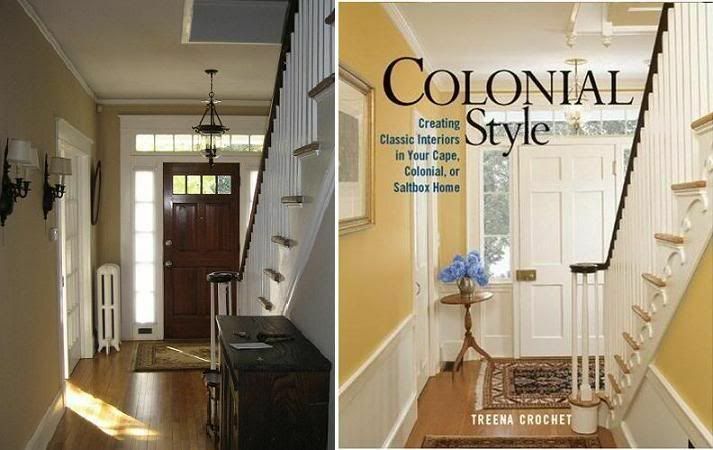 The image on the right is the cover of the book, "Colonial Style." Even the light fixture is the same. The rest of the details are also spot-on. Biggest different is, my rug is not as pretty as theirs. And, we have an original ice box door, too. 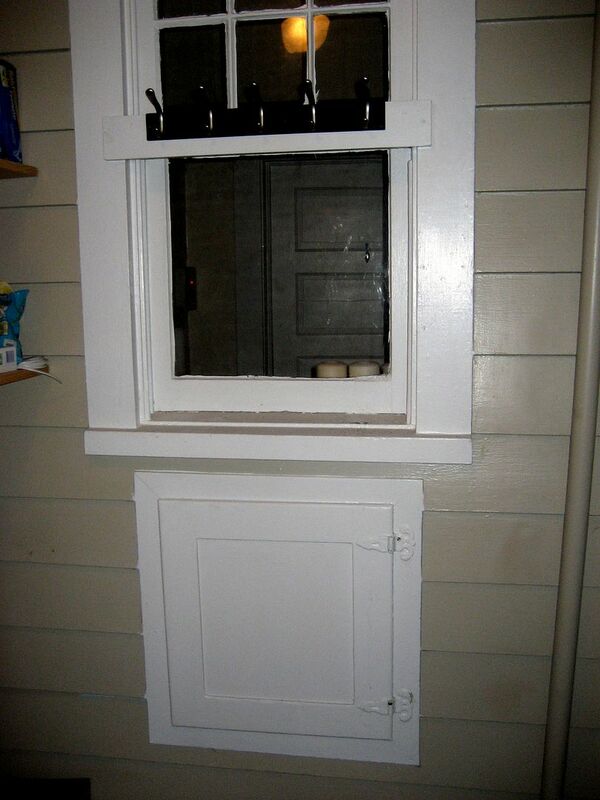 Back in the 1920s, this door provided access to the back of the icebox, so that the iceman could deliver a 25-pound block of ice to the ice box without entering the home. This was also known as "the jealous husband's door." 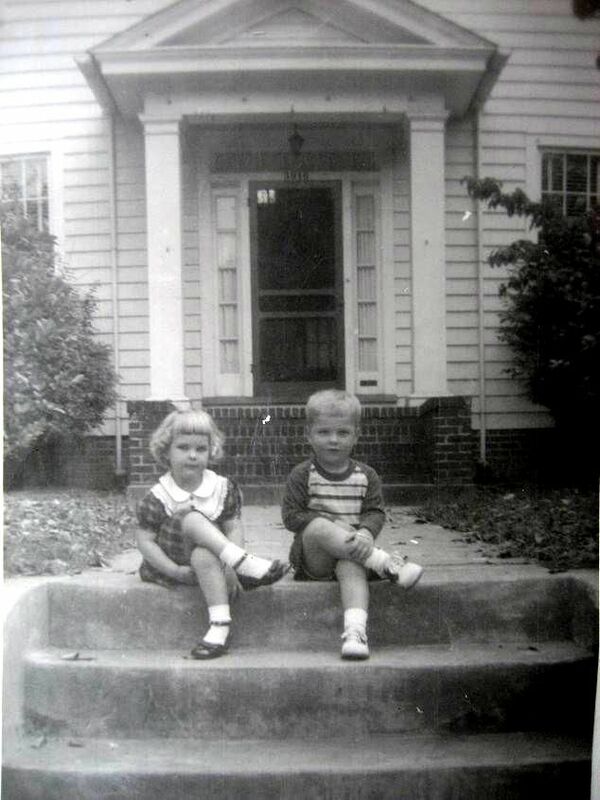 The twin grandchildren of the home's builder (William Barnes) sit on the front stoop (mid-1950s). They were born and raised in this house. The home remained in the Barnes' family until 1971, when it was sold to new owners. 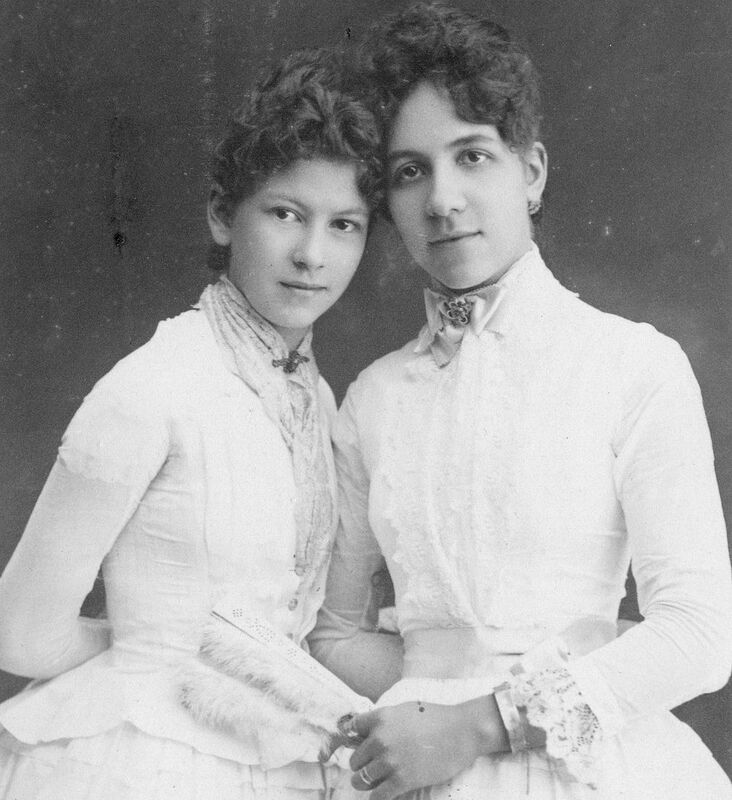 Laura (on the left) supplied the family photos, which proved invaluable in the home's restoration. The house at 3916 Gosnold Avenue. Classic lines and high-quality workmanship make this a timeless beauty. On the back porch is this old "Milk Door," which provided a place for the milkman's deliveries, whether or not anyone was home (and/or awake!). A corresponding door in the pantry enabled the housewife to retrieve deliveries without stepping outside. 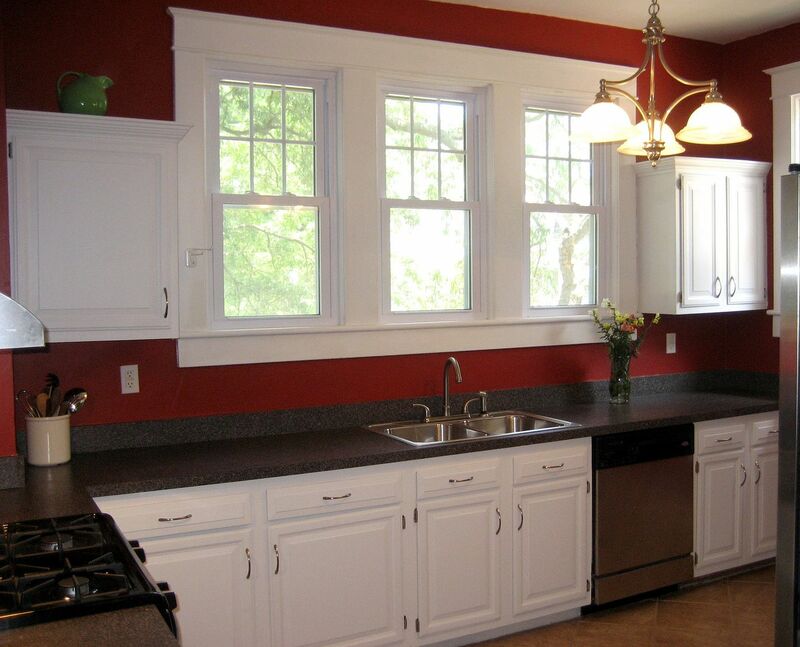 The house has 32 windows, and 7 of them are in the kitchen. 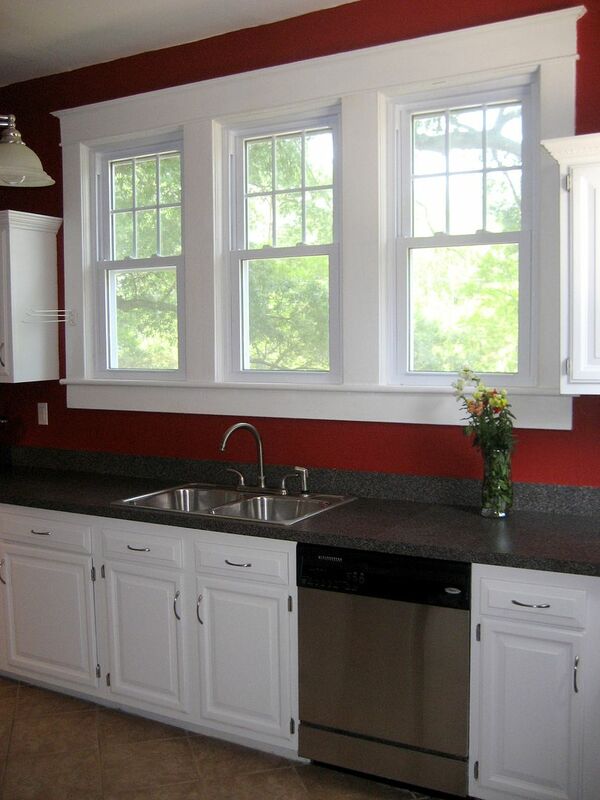 One of my favorite features in the kitchen are these many beautiful windows. The gas stove (left) is less than 30 days old. 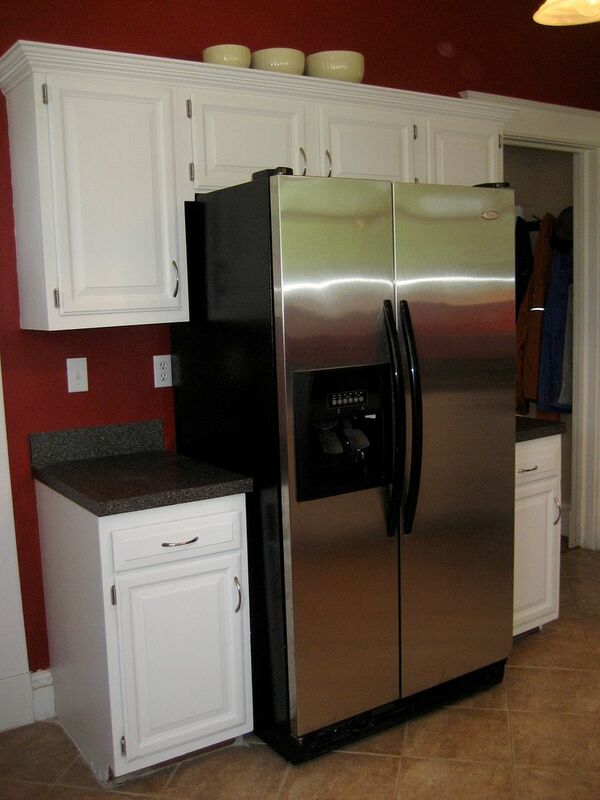 The dishwasher and fridge (both stainless steel) were new in March 2007. 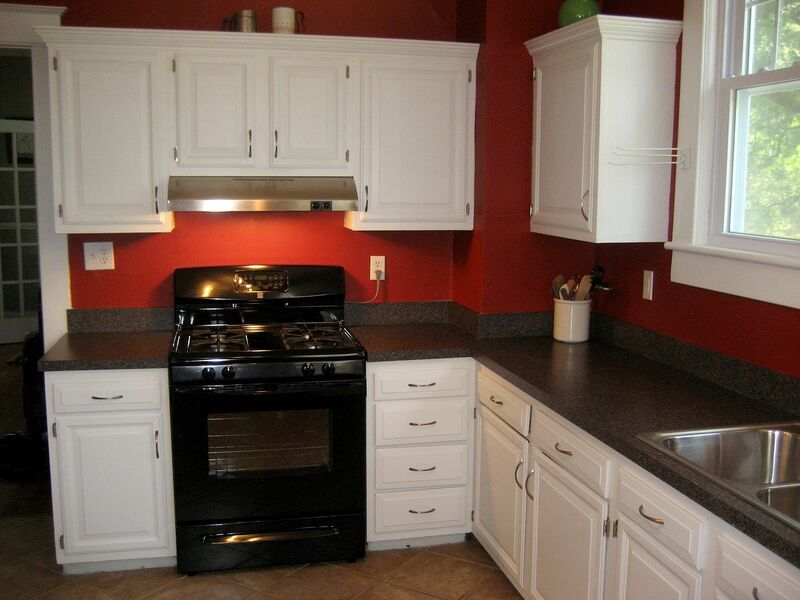 This spacious kitchen was remodeled in Spring 2007. The gas stove was installed less than a month ago. Still shiny new! Really big refrigerator does everything but serve you buttered toast in the morning. The living room is awash in light with a western and eastern and southern exposure. The living room is 25 feet long and 13 feet wide. 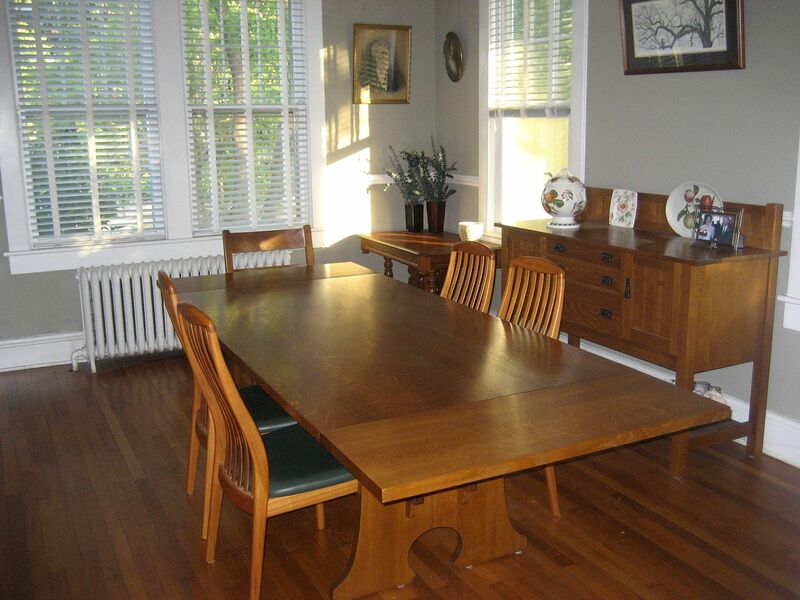 The spacious dining room has four windows (six feet tall!) and has beautiful oak floors. 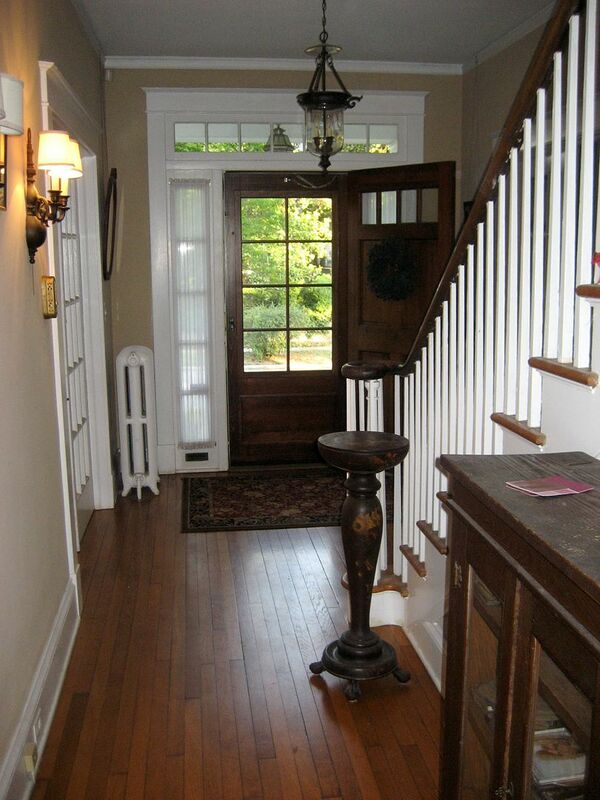 Visitors to our home frequently comment on the beautiful foyer. 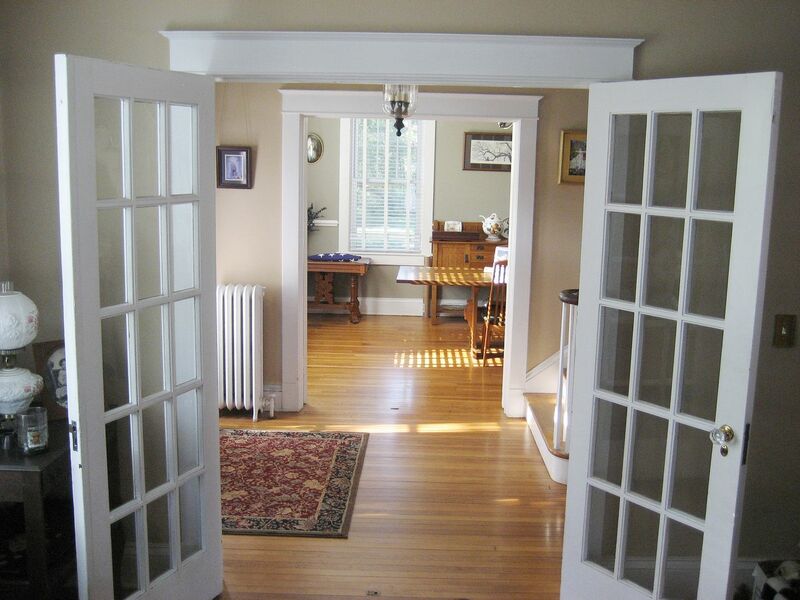 Original french doors to the living room and dining room are still in place. 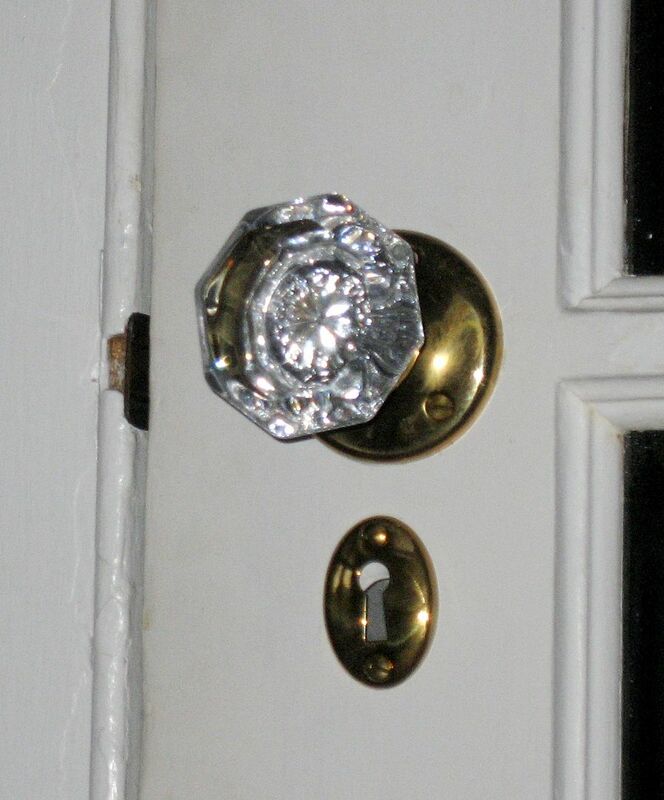 And did you notice those shiny doorknobs on the french doors! A view from the staircase. Another view of the foyer. 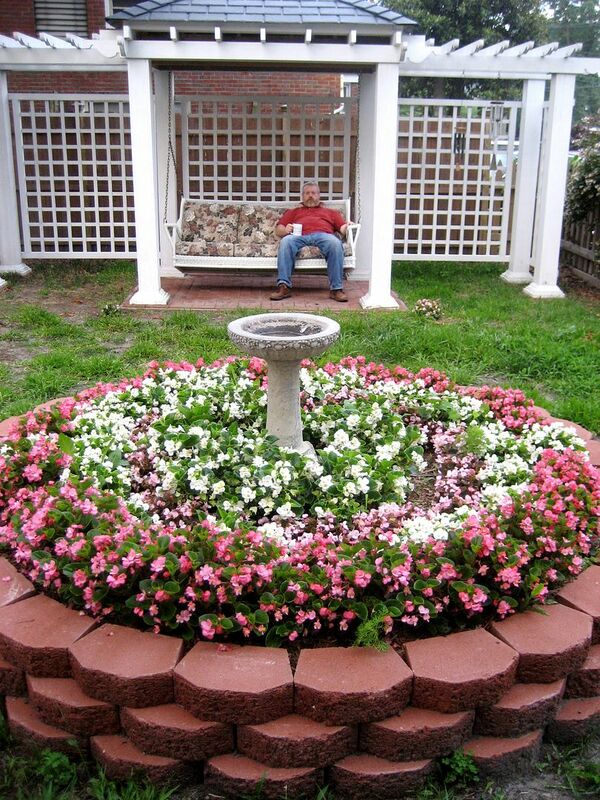 The house is also a gardener's delight, with provisions to collect and store more than 200 gallons of rain water. Your own private farm awaits: Tomatoes, corn, cucumbers, zucchini, strawberries, carrots and lettuce will be ready for harvest in about 30 days. Hubby does not convey. Usually. Carrerra marble under radiator and toilet complement the hex flooring. Work was done in Spring 2010. 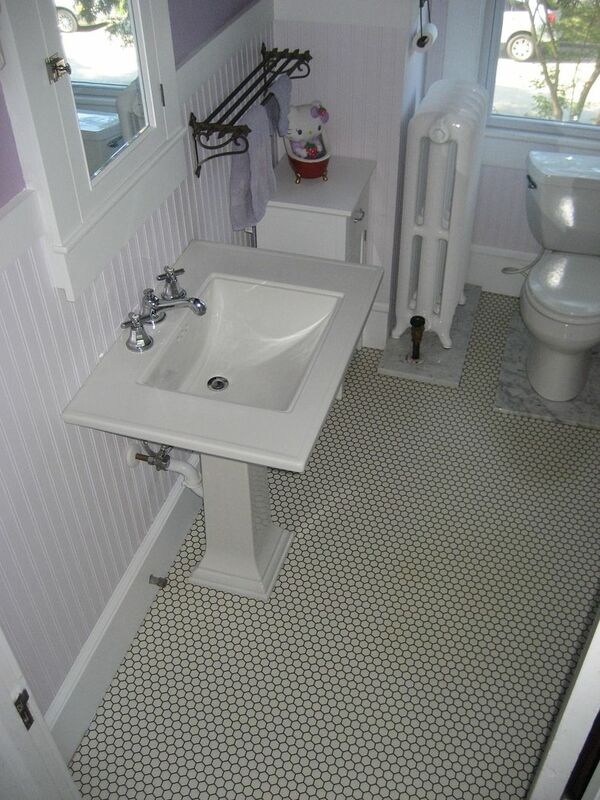 Bathroom was restored to its original 1920s appearance. 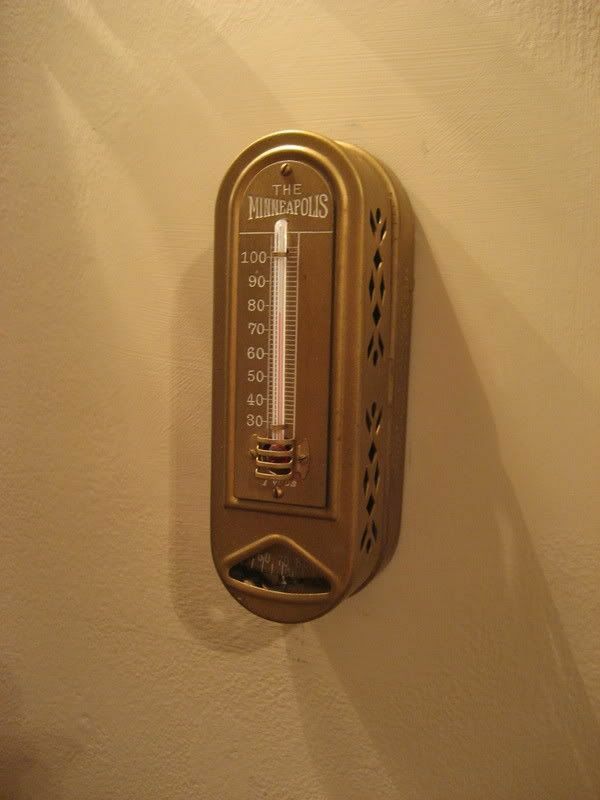 This 1930s vintage thermostat works beautifully, controlling a 2011 high efficiency gas boiler. It's the little things that make an old house a special home. 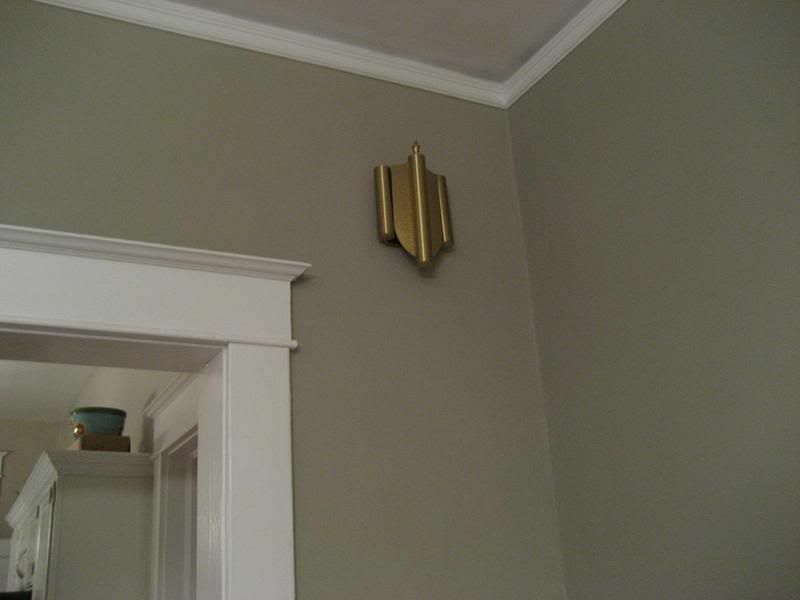 Vintage doorbell installed in 2008, and it has a beautiful chime! 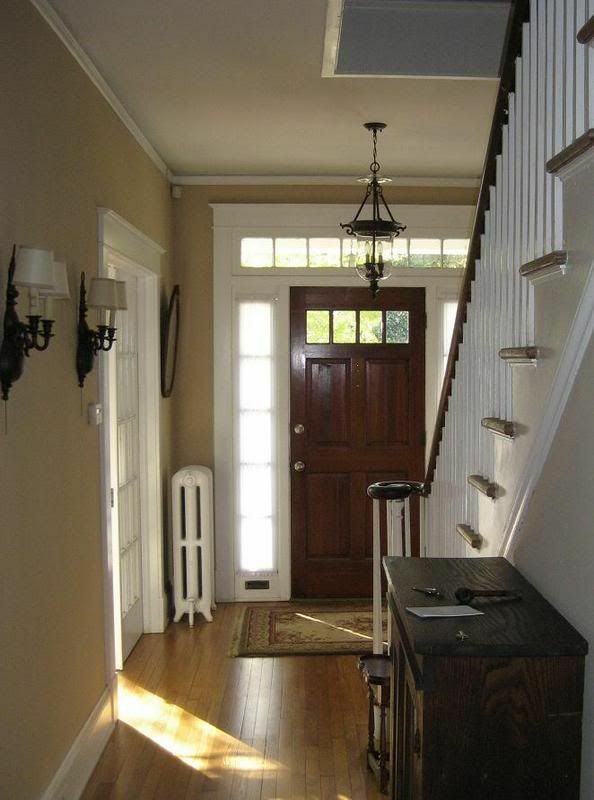 Front entry foyer is 11 feet wide and 25 feet long. Spacious sunporch has built-in bookcases that are 9-feet tall. 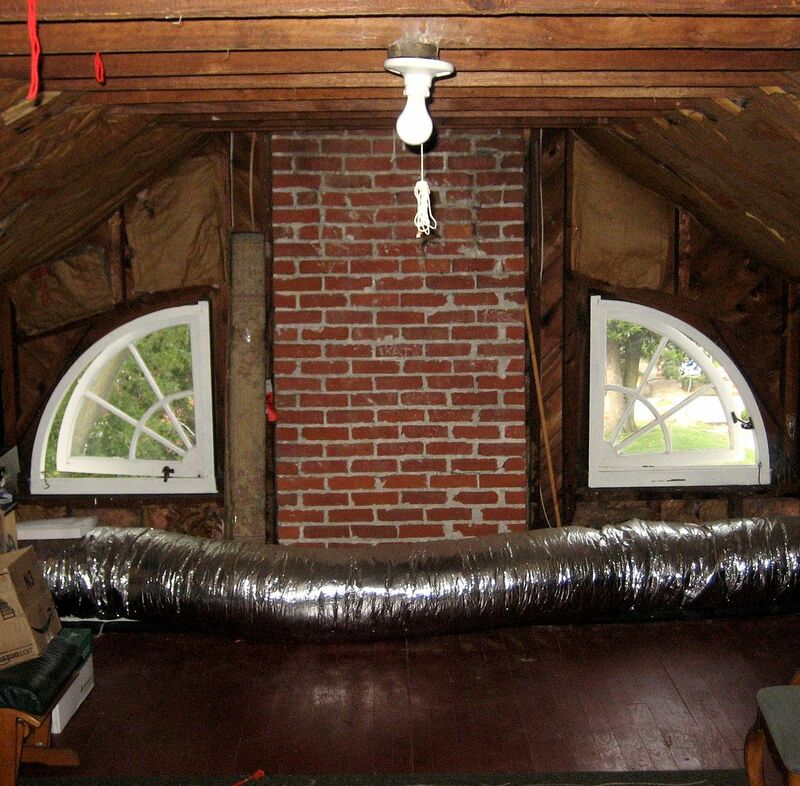 Even the attic is spacious and grand! And with a little back-lighting, these windows can scare the beejeebies out of the trick or treaters on Halloween night! If you look up, you'll see collar beams on all of the roof joists. The house is topped with Buckingham Slate (recently restored), which weighs 1,400 pounds per square (100 square feet). 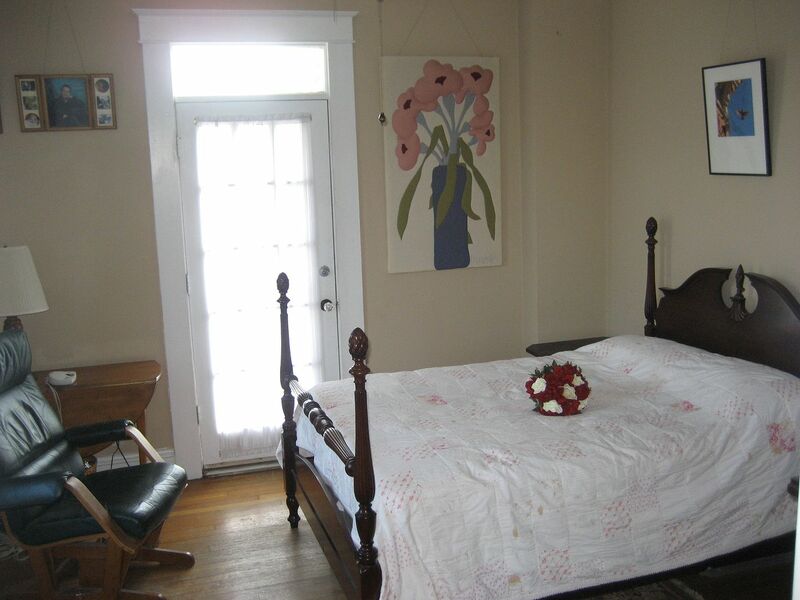 Little house (address is 3916-1/2) has a floored attic, vintage windows and slate roof. 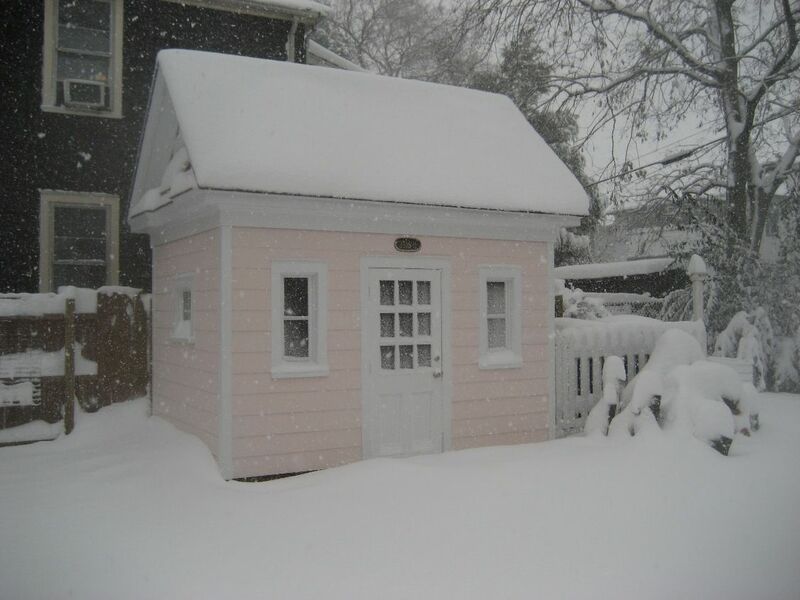 Another view of the little house. Private, off-street parking and a uniquely large yard for Colonial Place make 3916 Gosnold Avenue a quiet oasis amidst a sea of classic old houses. Another view of the pergola. Dog does not convey. 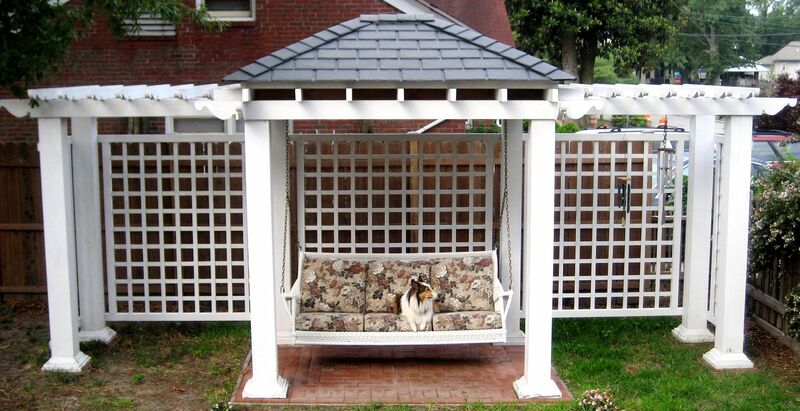 Teddy the Dog wants to know if the new house will also have a dog swing like this one. 1) Low electric bills - average budget bill of $115/month (and we love our air conditioning!). 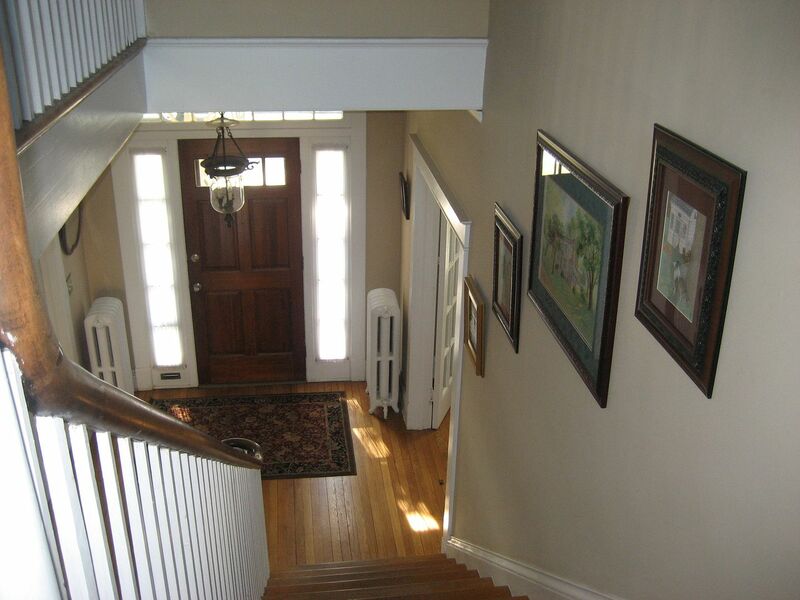 2) High-efficiency central air (14 SEER) with all new ductwork, and electrostatic air cleaner (installed October 2007). 3) High efficiency, top-of-the-line gas-fired boiler (94% efficient) installed March 2011. 5) Seamless 6-inch (extra large) aluminum gutters and downspouts. 6) No worries about old plumbing! Entire house replumbed with new copper lines in 2007. 7) Electrical service updated (some new wiring and new panel) in Spring 2007. Fresh paint, too! 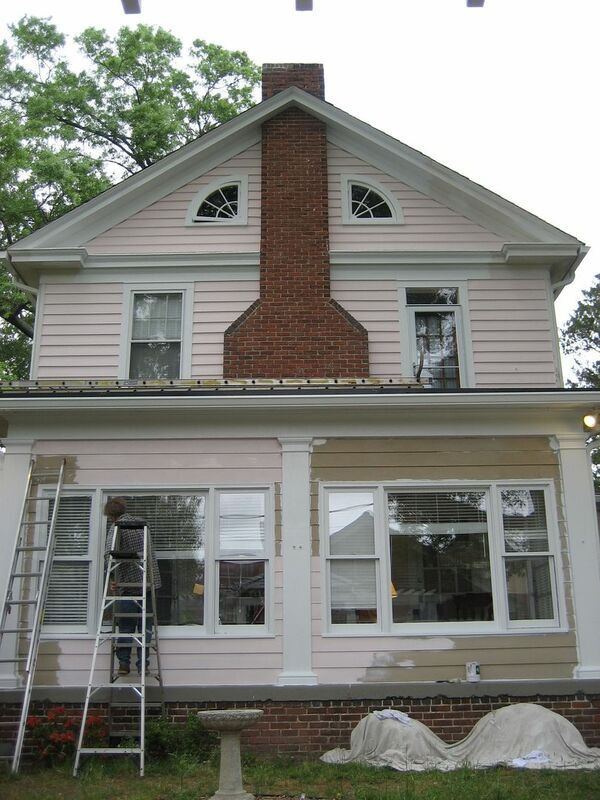 Two coats of Sherwin Williams Duration (25-year warranty) cover the home’s cypress clapboards. 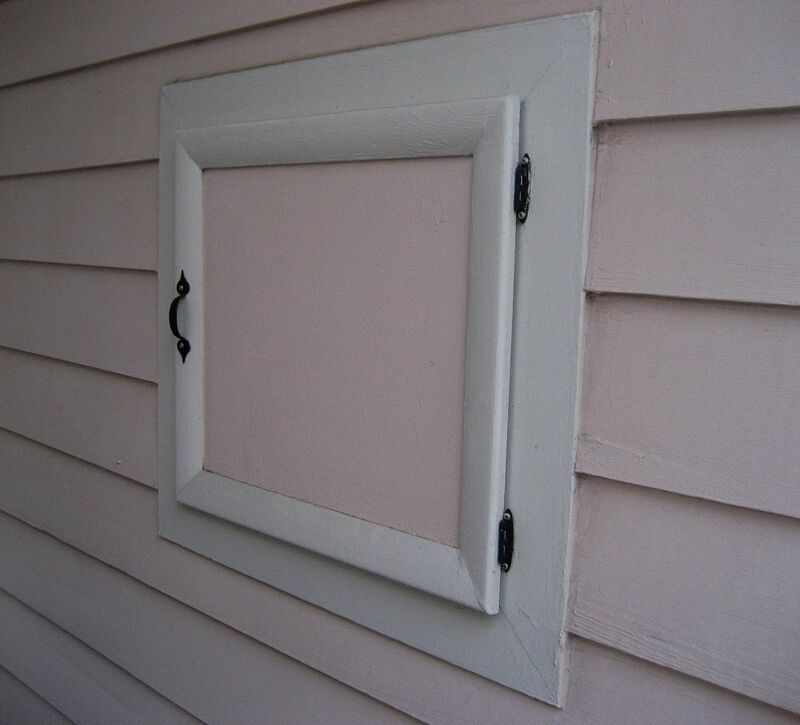 9) Eleven new high-end replacement windows have been installed within the last two years. 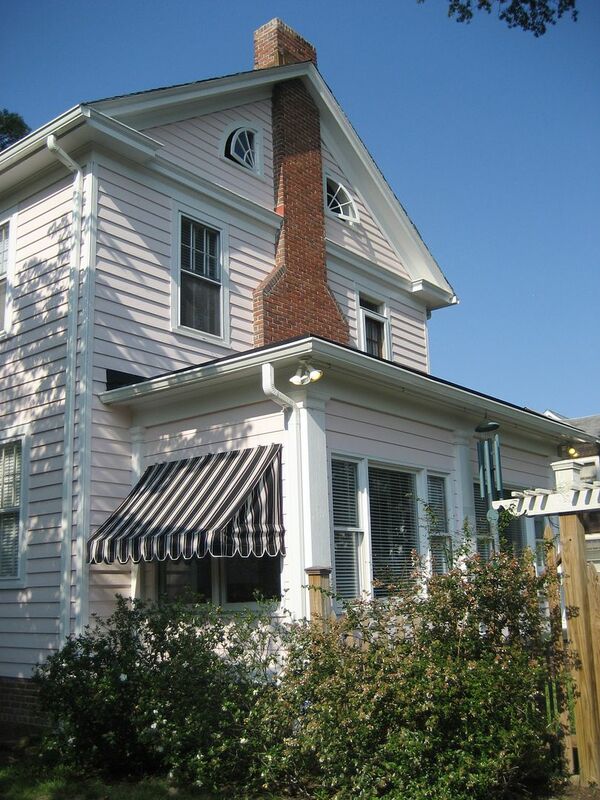 Windows on home’s front are original (to preserve architectural integrity). 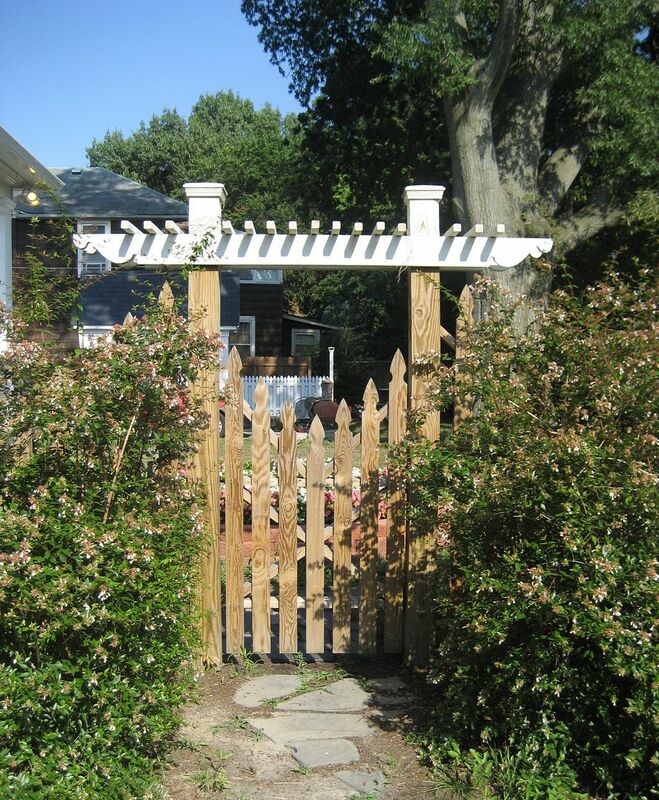 10) “Move-in ready” for your favorite quadruped! 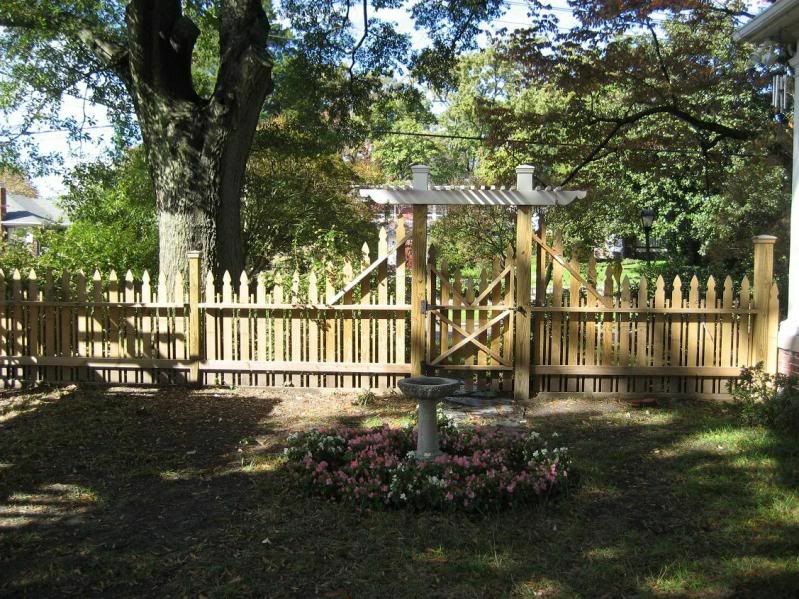 Custom-built picket fence surrounds peaceful back yard. 11) Who doesn’t love a little house, especially one with a slate roof? 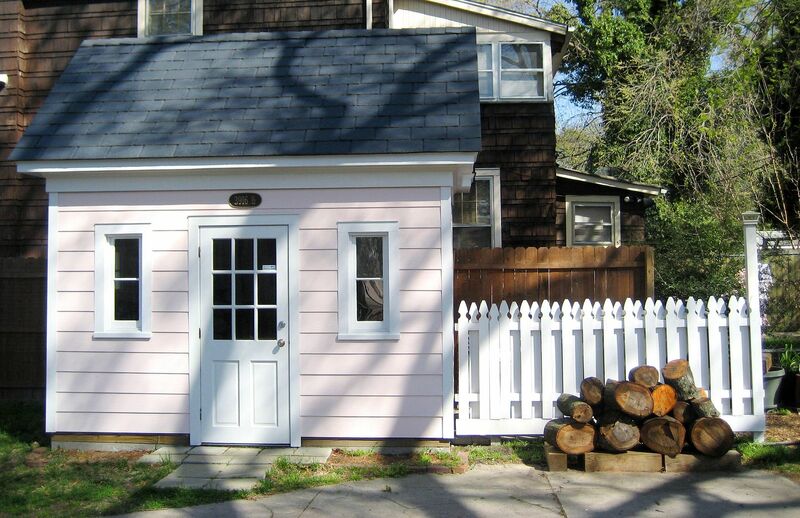 “3916-1/2 Gosnold” is a custom-built “mini-house” with a 9′ ceiling, floored attic, built-in ladder and vintage windows. 12) When it’s time for the morning’s ablutions, step into the bath and back in time. Faithfully restored second-floor bath features porcelain sconces, vintage medicine chest, and a Kohler Memoirs sink, sitting atop a restored hex floor. 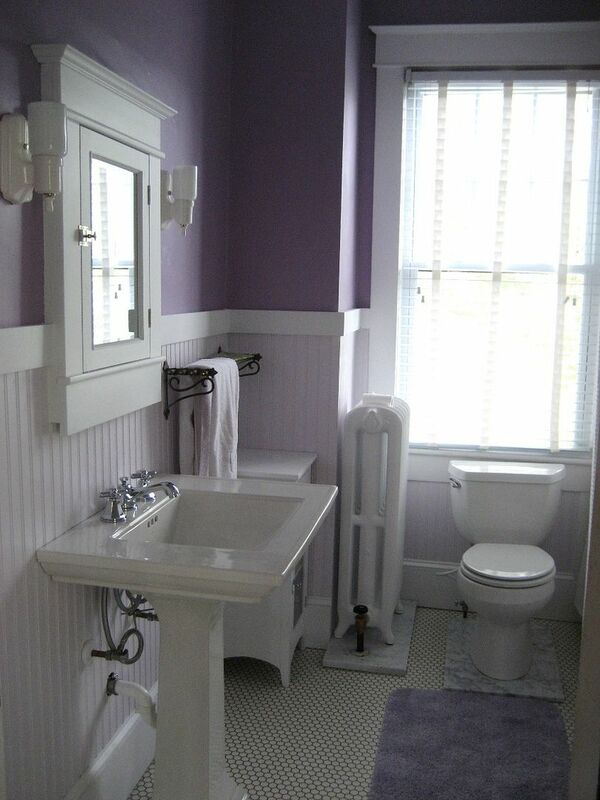 Also has elegant wainscoting, Danze high-end faucets and solid brass vintage towel rack. 13) Modern kitchen is full of light with seven large windows, stainless steel appliances and a brand new Kenmore gas range (May 2011). 14) Harvest Time is nearly here! Tomatoes, cucumbers, corn, strawberries, zucchini and flowers thrive in three separate raised bed gardens in spacious back yard. 15) Handy rain-water harvesting system already in place for those thirsty plants, with more than 200 gallons of available storage. 16) Bibliophiles delight! 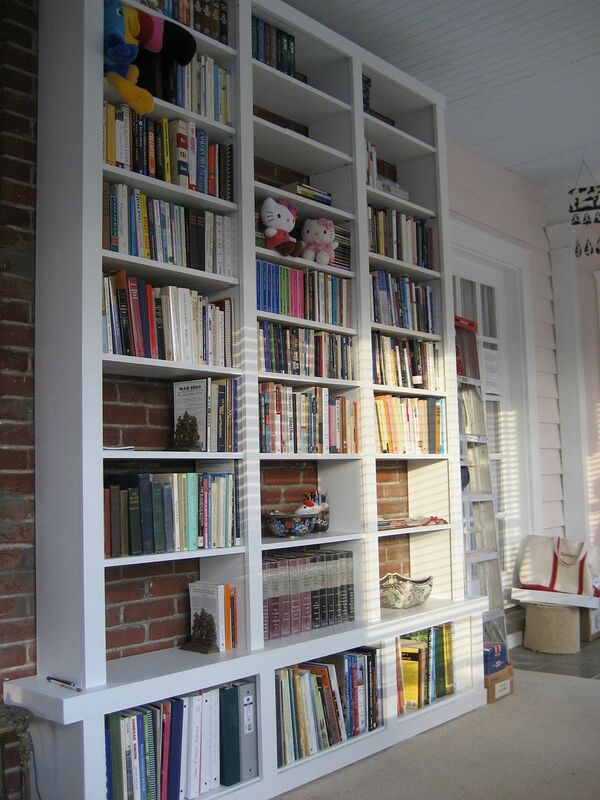 Built-in bookcase on sunporch is more than 9′ tall and 6′ wide, with 27 sturdy shelves. 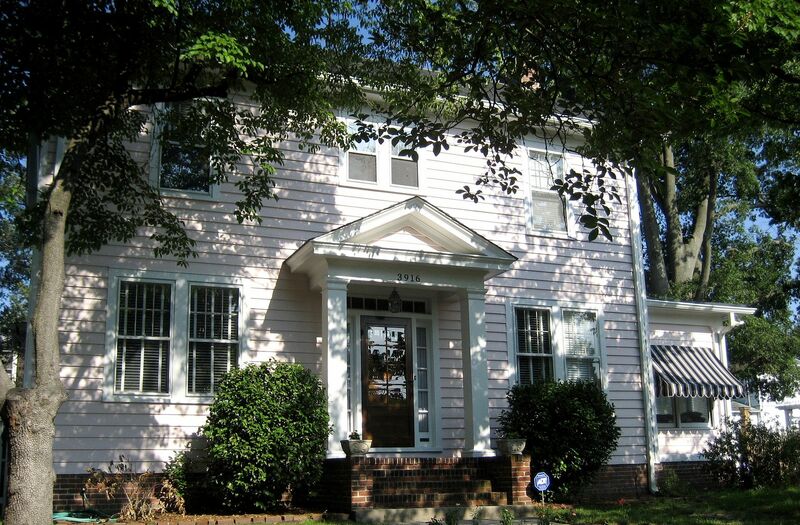 17) The house was custom built in 1925 by William Barnes, owner of one of Norfolk’s largest lumber yards. His grandchildren recall that he hand-selected every piece of framing lumber that went into the house. And it shows. To schedule an appointment, leave a comment below or contact the Realtor. When I started writing these blogs in late June 2011, I was still learning vast amounts of new information every day. The original blog that appeared on this page has been revised and updated, and below you’ll find a plethora of the most up-to-date information that I have available. So, was Aunt Addie shot in the head? According to Mary Wilson’s book (A History of Lake Mills, published 1983), Addie was murdered by her husband, Enoch J. Fargo. A cover-up story was contrived (diphtheria) to hide the truth. Wilson also states that Addie’s physician, William Oatway, participated in the cover-up, falsifying Addie’s death certificate. It looks like Mary Wilson was right. Below are the facts that we’ve discovered along the way. 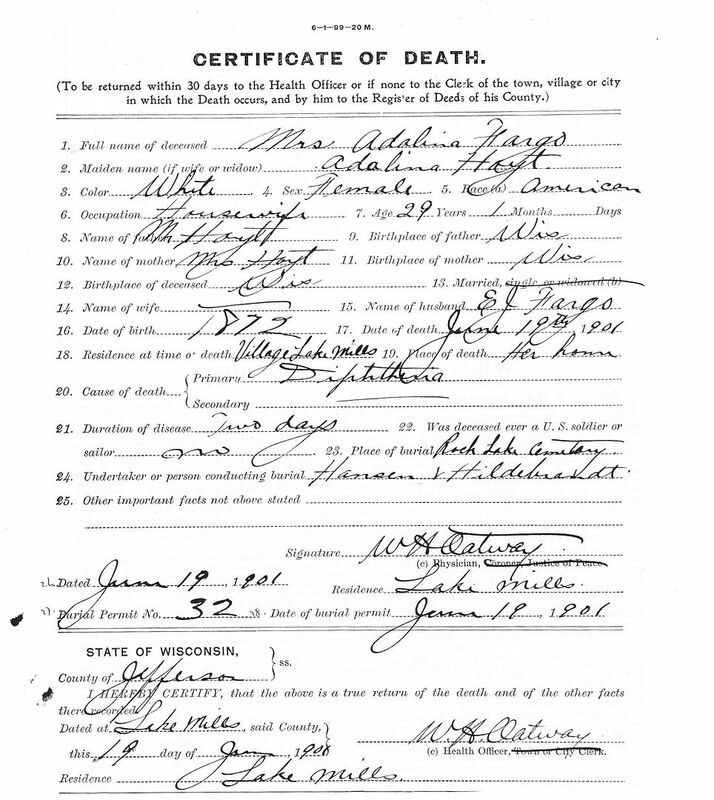 1) Addie Hoyt Fargo was buried without a burial permit, and this was a violation of Wisconsin state law. The county health officer was Dr. Oatway, and as county health officer, he knew that failure to obtain a burial permit was a direct violation of state law. These laws had been created specifically to help track and mitigate the spread of contagious disease. 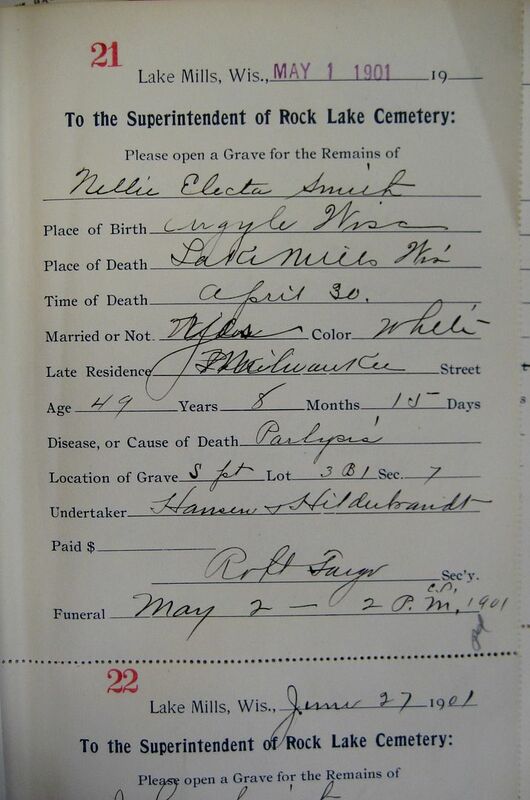 Yet on Addie’s death certificate, Dr. Oatway stated that a burial permit had been obtained, and it was “burial permit #32″ (see below). Permit #32 belonged to Alinda Hornily who died on March 26, 1902 (these permits were in chronological order). 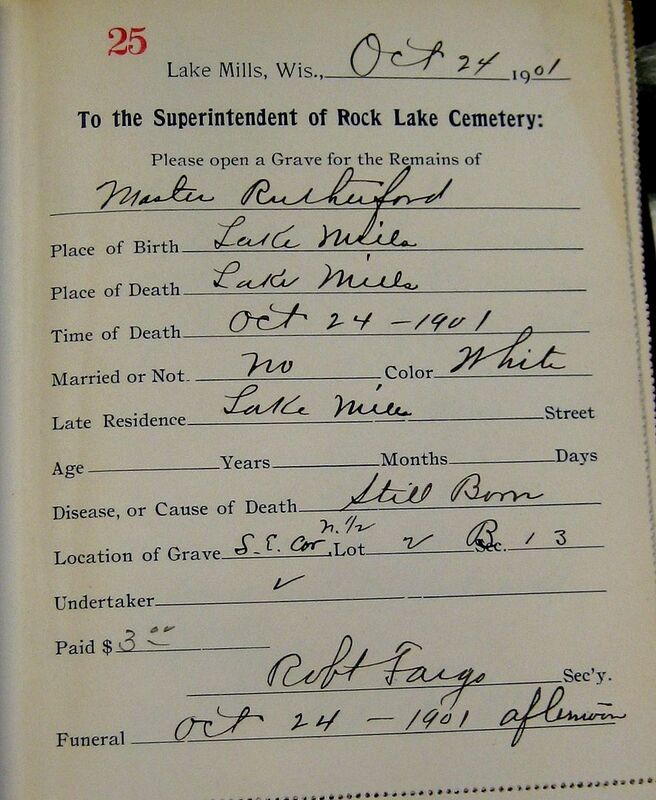 The absence of a burial permit is very compelling evidence, and tells us, a) Oatway did falsify the death certificate, b) Oatway knowingly violated state law by signing off on the death certificate and then certifying it as true (while knowing it was false), c) A funeral director was not involved in Addie’s burial (or if he was, he was also complicit, because he knew the death certificate was a falsified document because there was no corresponding burial permit). 2) The burial permit was a STATE document, but the death certificate was NOT a state document. If a burial permit had listed diphtheria as the cause of death, the state *may* have investigated. When a contagious disease occurred, there were protocols required to prevent the spread of disease. For instance, state law required that a home be fumigated after death from contagious disease had occurred and personal possessions be burned or buried. A burial permit listing diphtheria as the cause of death would have raised a red flag. Oatway, entrusted with the position of County Health Officer knew this, so he lied on the death certificate and never obtained a burial permit for Addie. Doing this meant that the diphtheria story stayed local, and the information would probably not reach the state. 3) The State Board of Health (in Wisconsin) was formed in 1876 to track and mitigate the spread of contagious disease. 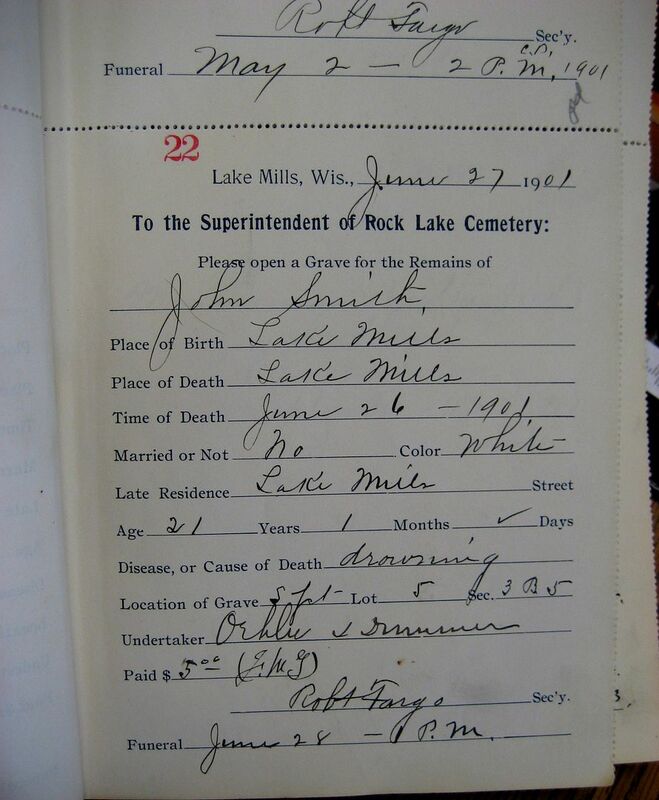 Each county health officer had to answer this statement in his annual report: “Are the laws requiring the issuance of burial permits enforced?” Oatway, in 1901, stated that yes, the laws requiring the issuance of burial permits were enforced in Lake Mills. 4) Oatway, being a county health officer, also certified Addie’s death certificate, meaning he swore that it was true and accurate. That’s especially egregious. 5) In Addie’s obituary (probably written by Oatway), he goes on at length, describing Addie’s fast-acting Ninja Stealth Diphtheria as the most virulent, fast-acting strain he’d ever seen, that prevailed even in the face of aggressive treatment and modern medical care. It’s quite a prosaic obit, and the doctor is the saddened hero in the story. 6) SO it’s the most virulent strain, the fastest-acting strain, and no modern treatment could bring it into subjugation. And Addie was married to Lake Mill’s wealthiest resident, largest employer, and they were living in Lake Mills’ largest mansion. 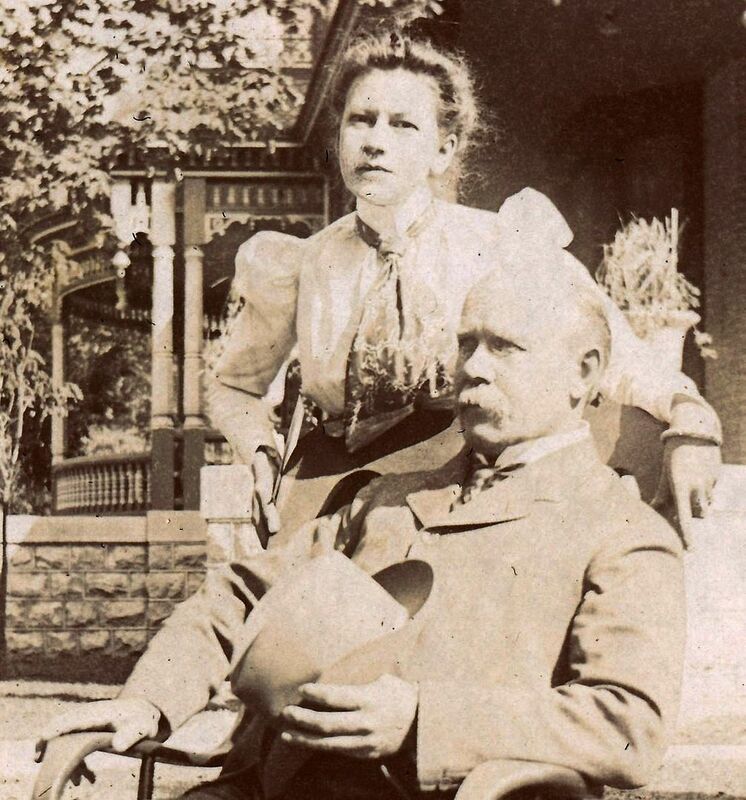 Yet a few months later, in his capacity of County Health Officer, when Oatway files his report with the State Board of Health, he reported that there were no cases of diphtheria in Lake Mills in 1901 (the year Addie died), and no deaths from diphtheria in 1901. Did Oatway lie when he wrote up Addie’s death certificate, or did he lie to the State Board of Health? 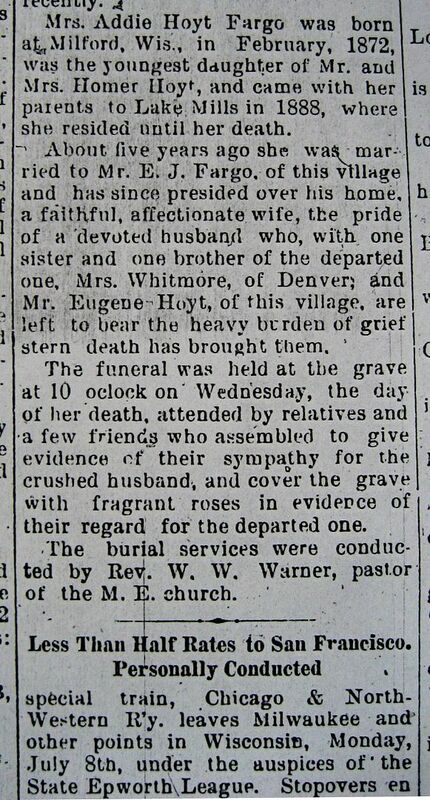 7) In the obit, Oatway opines that Addie probably contracted diphtheria during a recent trip to Portage. 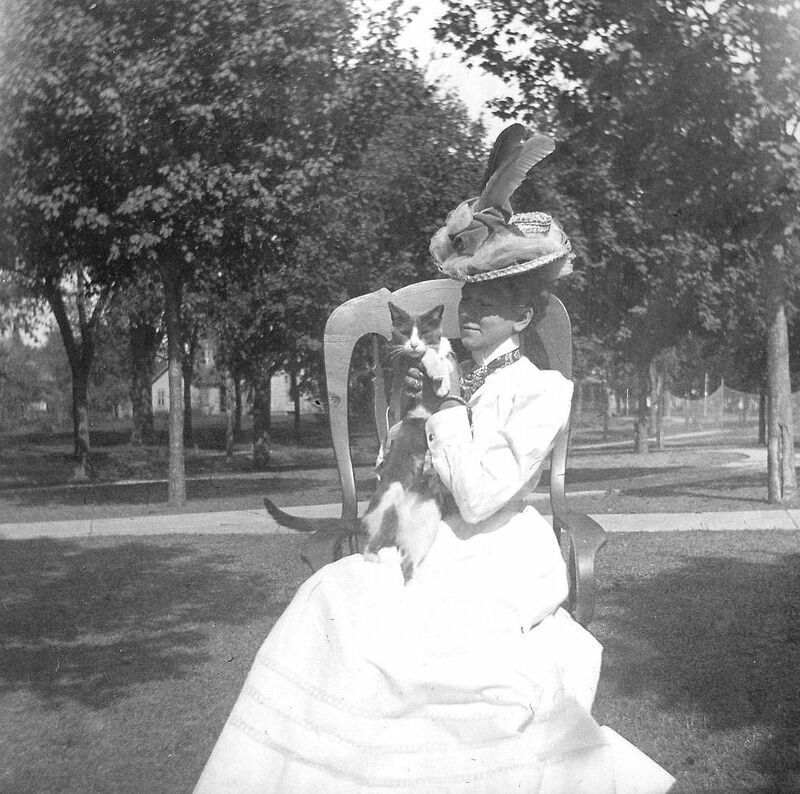 The newspaper reported she’d traveled to Portage for a convention on June 4th, 1901. Diphtheria germs don’t last longer than 1-4 days. And the county health officer in Portage reported that there were no case of diphtheria in Portage in 1901. There’s that stealth component again. Addie contracted diphtheria in a town with no diphtheria. 8 ) In the obit, Oatway says that Addie died 15 hours after onset, when the membrane formed in her throat, broke off and suffocated her. In the progression of diphtheria, this membrane doesn’t even start to form until 2-3 days after onset (according to the CDC), and children (its most frequent victims) died 4-6 days after onset (if the membrane was the cause of death). Typically, diphtheria killed adults when it settled into their heart and/or brain. 9) Diphtheria was not an automatic death sentence: Far from it, in fact. 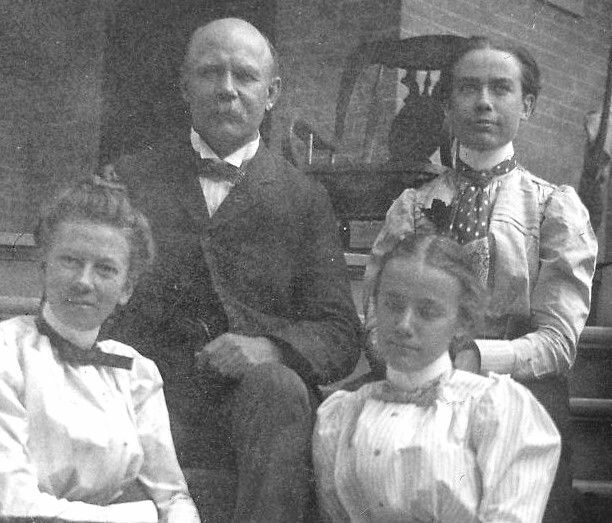 In 1900, in the state of Wisconsin, the death rate for a diphtheria victim was 13% state-wide, and 9% in small towns (population less than 2,000) and that number included children. If you could take children out of the mix, the rate would probably be less than half that. Children more than five, and adults under 40 had the best chance of surviving a bout of diphtheria. 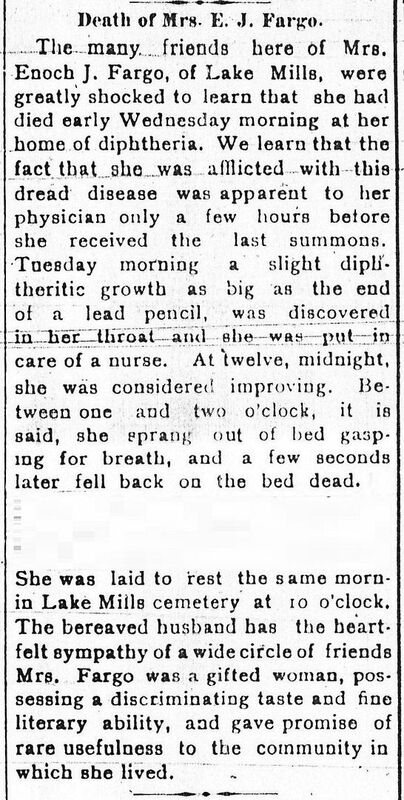 In other words, people Addie’s age (29) had the best chance of surviving diphtheria. 10) During the exhumation, we found that Addie was buried at 34″ which is incredibly shallow. This tells us that Addie’s grave was dug by someone who was not a professional grave digger, in part because of the depth, and in part because there was no burial permit. Before the exhumation, I consulted with several professionals in the funeral business, and they told me that I should be prepared to dig to 6-8 feet to find Addie’s remains. The “freeze line” in Wisconsin is 3-4 feet, and in case of contagious disease, periodical literature recommended that a grave be dug “extra deep” as a protection. 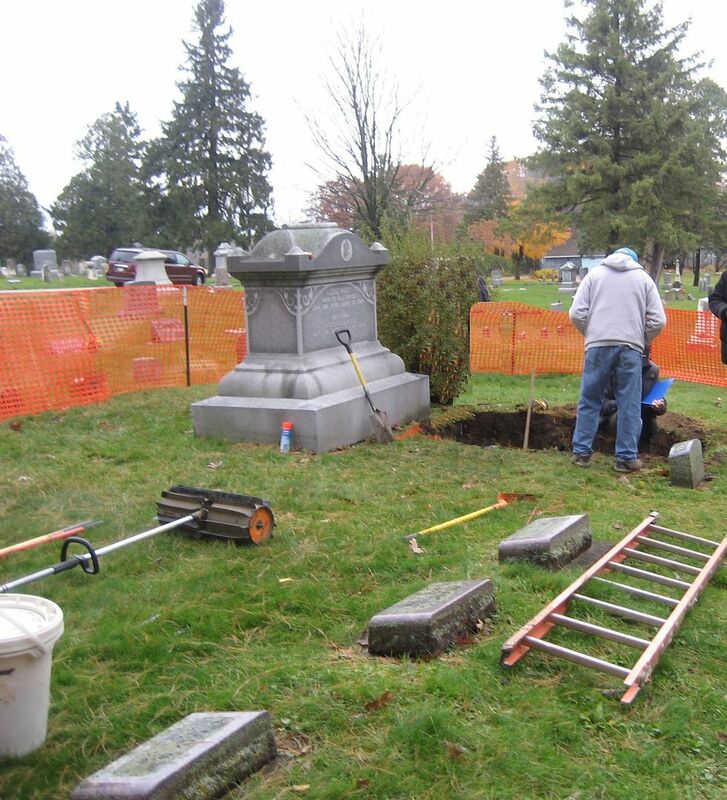 Plus, grave robbing was a problem in the late 1800s, and the six-foot depth offered some protection against that.This was NOT a professional grave digger. It’s more likely that this was someone’s hired man, who got tired and stopped at 34″ (or as the sun was rising). On June 19th, 1901, the sun rose at 4:11 am. A professional grave digger would not have stopped at 34″. But whomever buried Addie, put her coffin in the dirt as soon as there was enough clearance to put a layer of topsoil over the grave. After all, who would ever know? 11) The most compelling piece: Addie was wearing her shoes in that grave. The obit says she died at 2:00 am after a valiant struggle with this awful disease and was buried immediately. How many people wear shoes in their sick bed? Surely, Uncle Bob could have arranged that. Why didn’t Enoch do that? To read more about Addie’s exhumation, click here. To read more about how we know she did NOT die of diphtheria, click here. 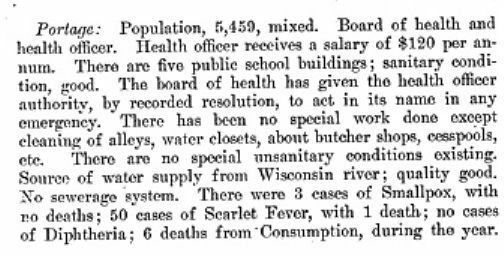 This snippet appeared in the "Report of the State Board of Health" for Wisconsin and covered the the time period during which Addie Hoyt allegedly died of diphtheria. 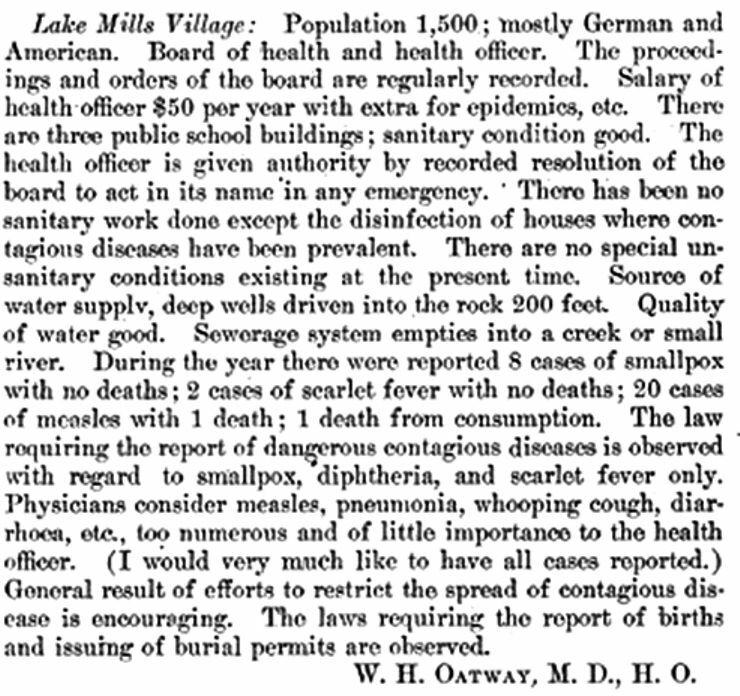 This statement, taken from the above text and penned by Oatway, says that if there was a case of diphtheria in his town (Lake Mills), it *would* be reported. 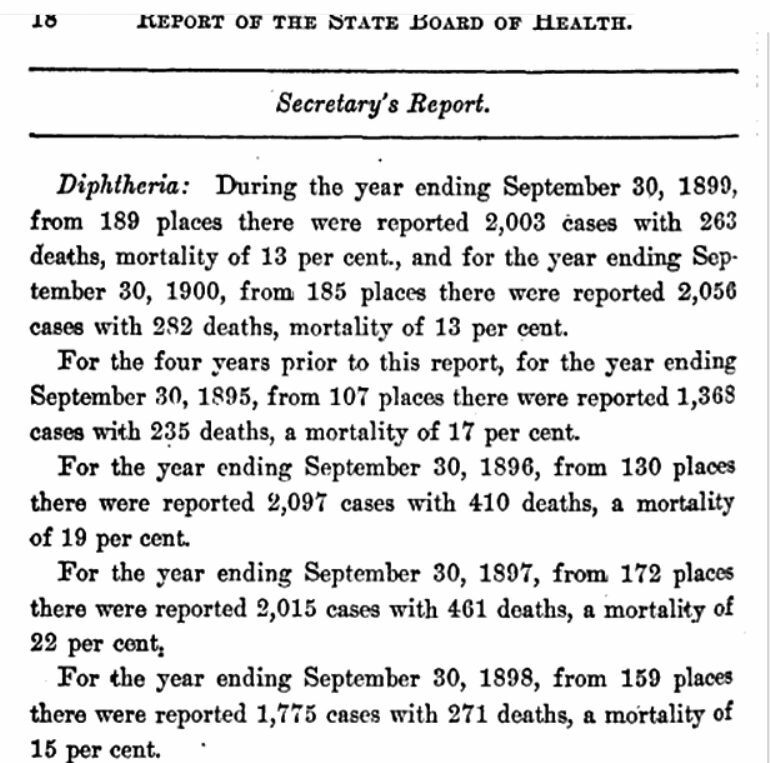 Stats on diphtheria deaths, as seen in the 1899-1900 "Report of the State Board of Health." In smaller towns, the mortality rate from diphtheria was much less than the statewide average of 13%, and was closer to 9%. In Milwaukee (Wisconsin's largest town with 280,000 residents), the mortality rate was closer to 16.75%. Actually, Addie was born in January 1872. Sheesh. At the bottom, it does say Addie had a funeral, but that would have been logistically problematic. Dead at two, buried by 10, how did they notify people? Typical Victorian funerals were grandiose affairs; the wealthier the better! More on that below. 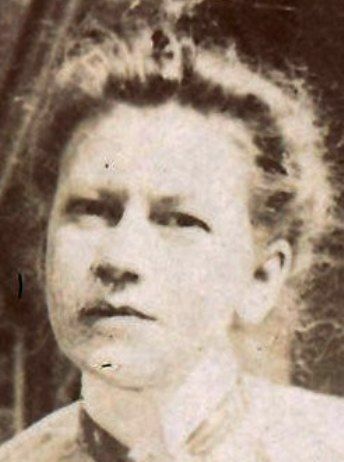 Under the date (June 1901), Addie's death certificate reads, "Burial Permit #32." State law demanded accuracy in reporting of birth certificates and burial permits. He would be required to lie again when he submitted his written report to the state of Wisconsin. This burial permit (#21) is dated May 1st, and the death occurred the day before - April 30th. Addie's should have been permit #22 (judging by the date). But "John Smith" died on June 26th, and this burial permit was dated June 27th. 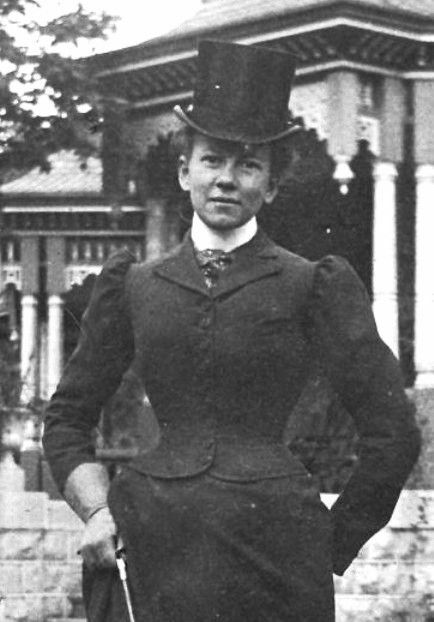 Addie died on June 19, 1901. As mentioned above, burial permits were required for every grave that was opened. This burial permit was for a stillborn baby (unnamed). As cemetery sexton Bill Hartwig explained, a burial permit was required for every grave - no exceptions. This was the only permit I saw that had the same permit date and death date. In the case of an unnamed, stillborn child, the logistics involved in burial were very different. 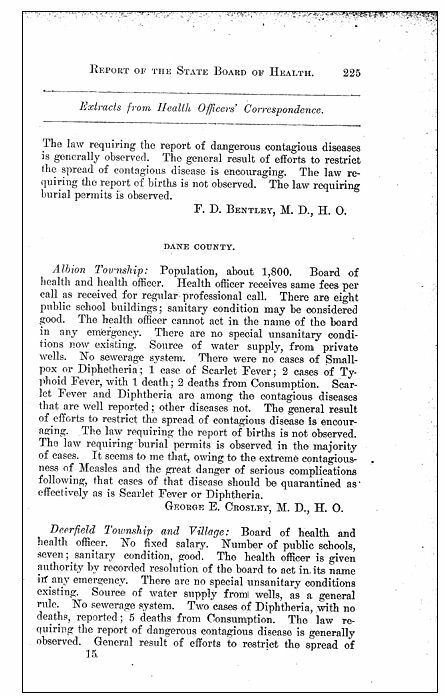 From the State Board of Health Report, this is the first page one of Dr. Bentley's report from Portage, WI. This covered all of 1901. Page two continues below. Dr. Bentley's report on Portage, second page (see top). Life with Enoch took a toll on Addie. She was 29 here. And why would a woman - who prided herself on her appearance - send this photo to her family in Denver? Did she want them to know what was happening to her in Lake Mills? Addie: Before and After Enoch. 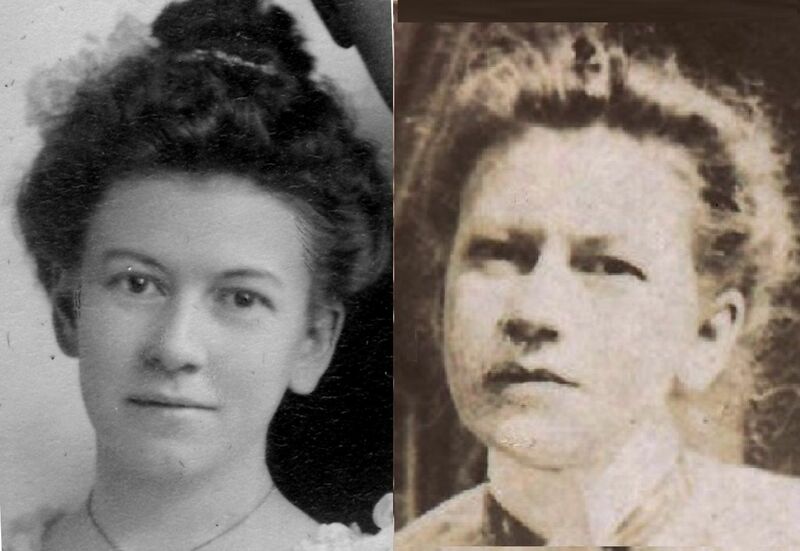 The photo on the right was taken five years after her marriage to Enoch. She was 29 years old, and she'd be dead soon after this photo was taken. Look at her receding hairline and swollen lower lip. Her "cupid's bow" is now misaligned, and there's pronounced puffiness under her right eye. I'm comforted to know that Addie had some happy days at the mansion. The fam sitting in front of the house in Lake Mills, WI. Enoch is at the top, with Addie below him. 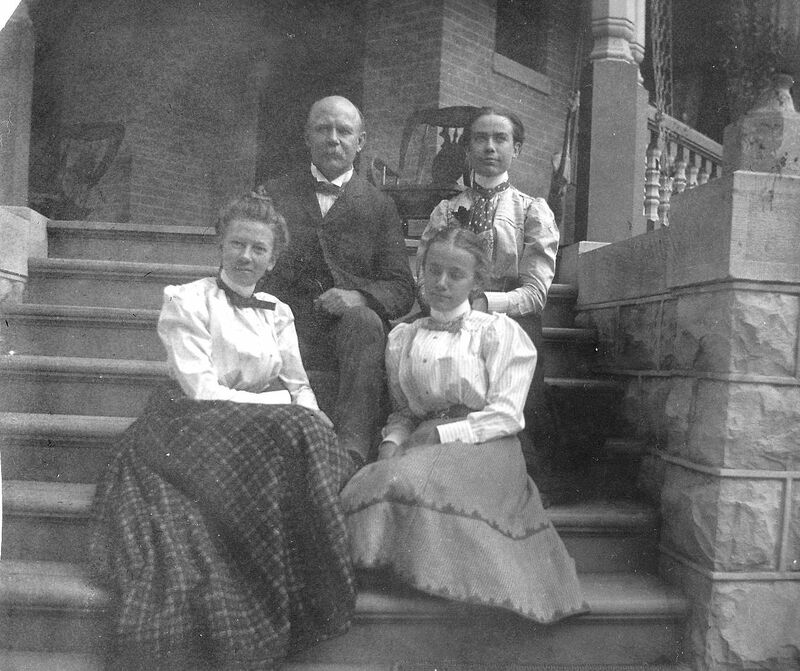 Enoch's two daughters are Elsie (top right) and Mattie (lower right). 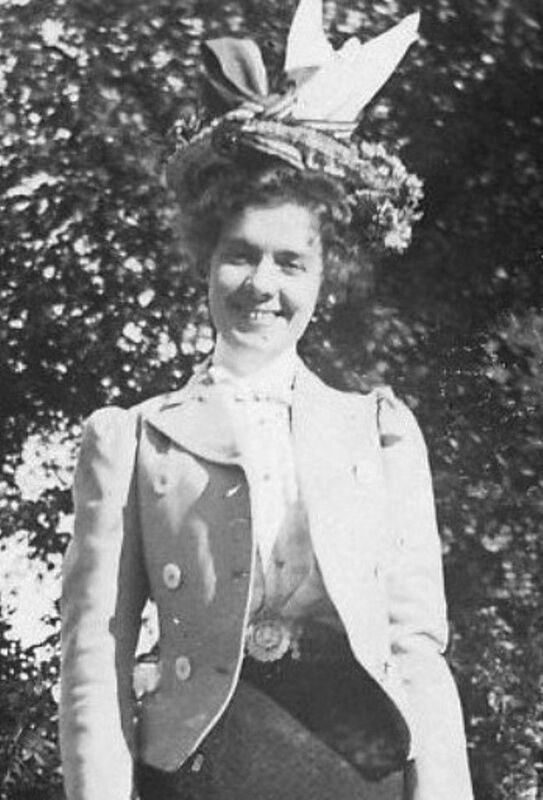 Elsie (1876-1959) married a McCammon. 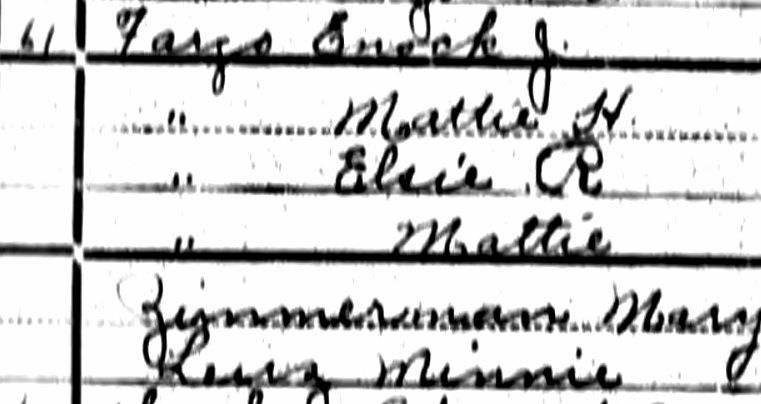 Mattie (1883-1956) became Mattie Fargo Raber. 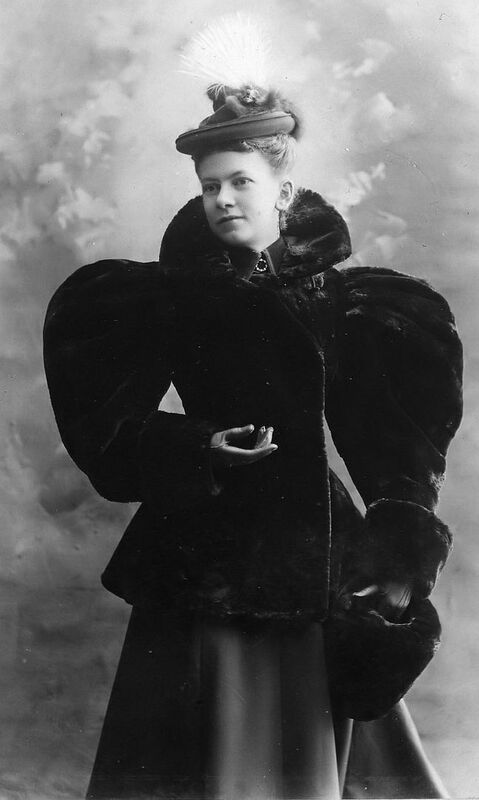 Was this what the well-dressed, sick-in-bed diphtheria patient wore in 1901? 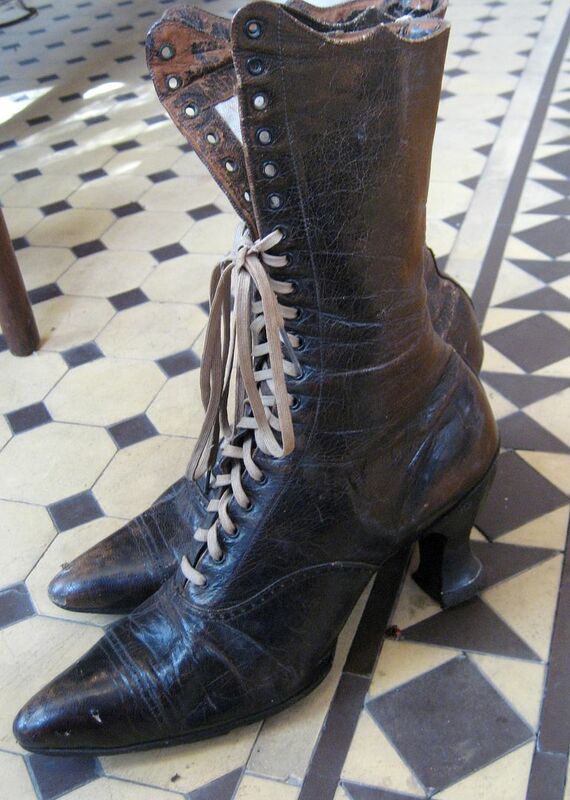 Based on the remnants found in Addie's grave, these were probably similar to the shoes that Addie was wearing (and was buried with) when she died in June 1901. 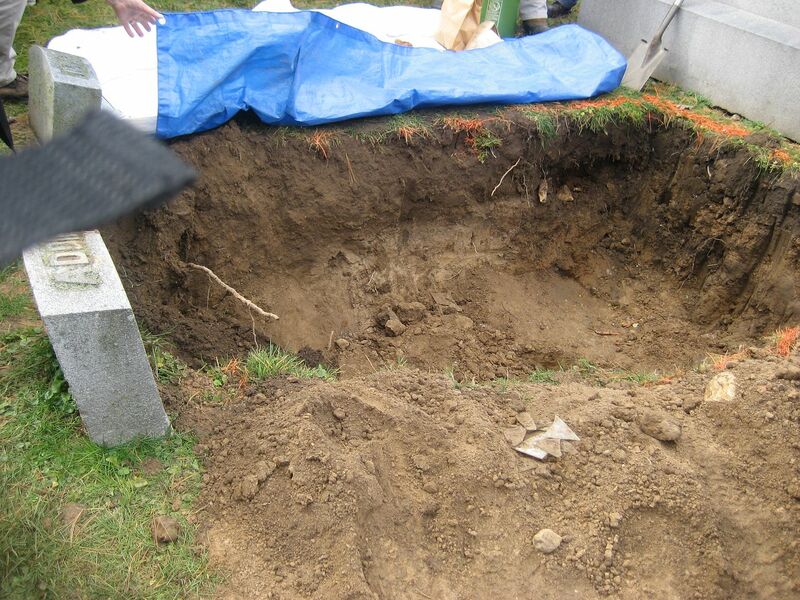 Addie was exhumed on November 3, 2011. She will not be returning to Lake Mills. After the autopsy is complete, Addie's remains will be coming home with me. Addie's grave was empty by 12:00 noon. 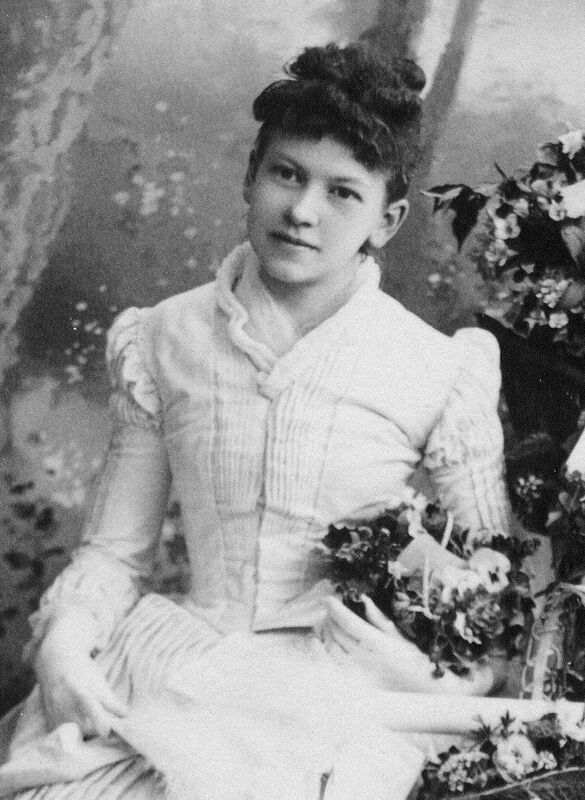 Addie in 1886 (about 14 years old). Addie and her sister, Anna Hoyt (my great-grandmother). 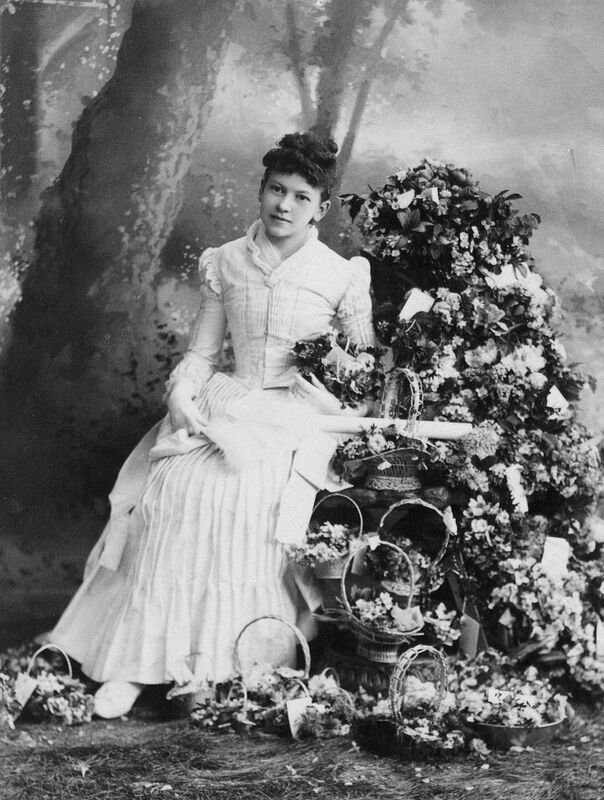 Addie in 1894, about 18 months before she married Enoch. 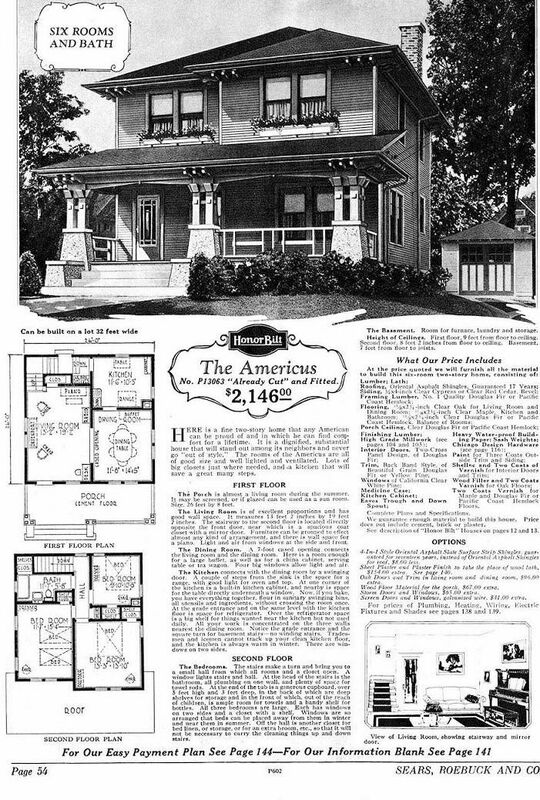 Did they *know* this was a Sears House when they killed it? Before I get myself into trouble with too many words, I’ll let the pictures tell the sad story. It’s in Pennsylvania, not far from that beautiful brick Magnolia in Irwin! 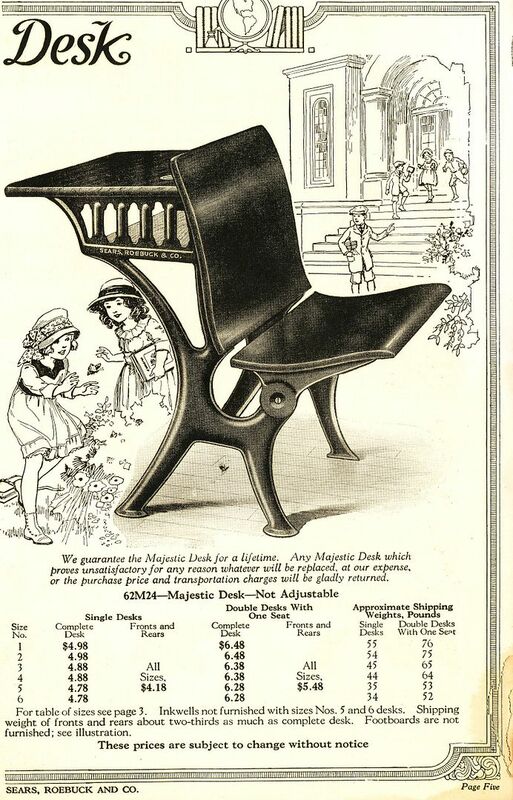 The Americus, as seen in the 1921 catalog. I think the bush is trying to protect it from street view. Grow Mr. Bush, grow fast! 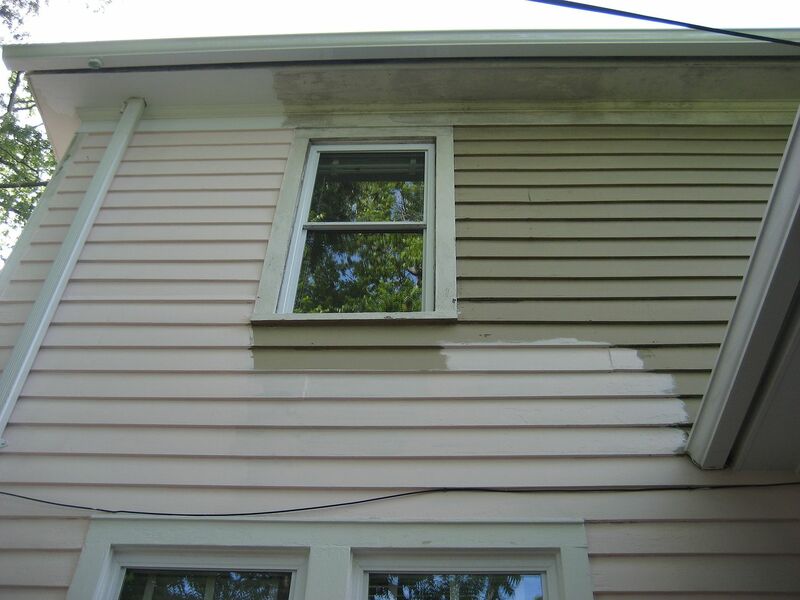 One of the defining features of the Americus is all those fine windows, most of which have been stripped by this "siding job." The other side isn't much better, but at least there are a few windows. Palate cleanse, courtesy Beckley, WV. To buy Rose’s most-excellent book, click here.